The Northern Territory is six times the size of Great Britain and boasts two paved highways. The Stuart Highway comes north from South Australia through Alice Springs, gateway to Uluru, and on to Darwin, the capital. The other, which changes name, crosses the north from Western Australia to Katherine, jogs south to about Tennant Creek, then continues to Mount Isa in Queensland. The northern portion of the Territory is known as the Top End. It receives monsoonal rains during 'The Wet' (November to May) and virtually no precipitation from June to October. The area south of Tennant Creek is arid to semi-arid to well south of the border with South Australia. Temperatures vary greatly across the year and also within a day. In arid regions like Alice Springs, evenings will be quite cool, reaching single digits before dawn in July and August. Midday temperatures during these cooler months routinely reach the high 20ºs. Summer temperatures (January and February) are 20º warmer, with highs routinely over 40º C.
From Katherine northwards the dry winter months are somewhat warmer, ranging between the mid-teens to the low 30ºs. The monsoons moderate the temperature in the summer, yielding highs in the mid-30ºs and lows in the mid-20ºs. In short, the desert is hot and the Top End is wet from November through May. Geologically, the state is the northeast section of the Precambrian Shield. The most recent formations are cretaceous marine deposits in the Simpson Desert in the far southeast, in a basin extending about 200km around Daly Waters in the state's central north, and small plains which lie intermittently along the coast. Paleozoic (mostly Cambrian) rock extends across the centre of the state, forming a tongue which nearly reaches Darwin. Proterozoic material forms a semicircle around these areas, including nearly all of Arnhem Land and the western and southern borders. The state is virtually surrounded by desert. The Great Sandy, Gibson and Great Victorian Deserts form its west and southwest. The Simpson Desert is the southeast corner. Near its centre is the Tanami Desert. Other dominant geological features include the Musgrave and Macdonald Ranges and the intervening Amadeus Depression in the southwest, the Barkly Tablelands in the northeast and the spectacular Kakadu and Arnhem Land at the Top End. In addition to these latter areas are the remarkable Uluru and Kata Tjuta monoliths near Alice Springs, Katherine Gorge, and the curious granite boulders south of Tennant Creek. Not unexpectedly, the soil types and flora conform to this geological and climatic pattern. Soil scientists mention extremely soda-filled rock, limited permeability and inherently low fertility. 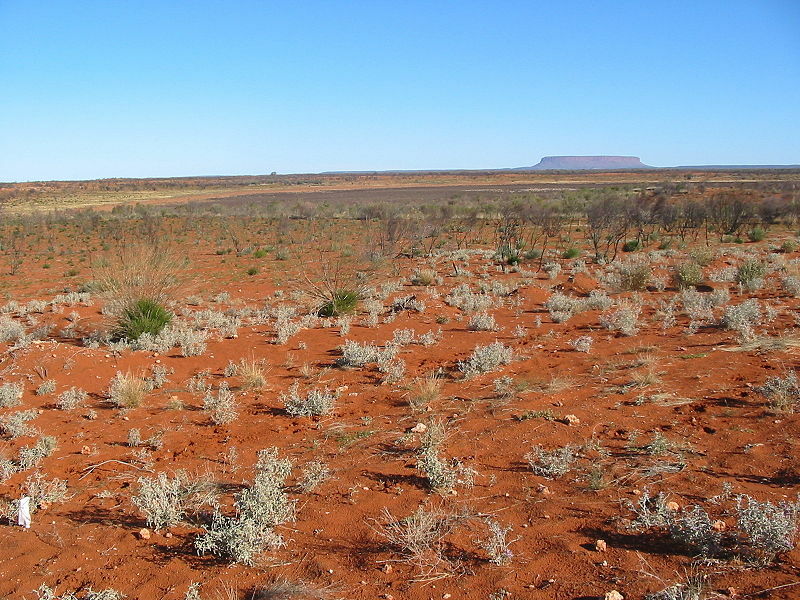 Deep siliceous soils form the Simpson and Tanami Deserts where the hummock grass spinifex prevails. Most of the Barkly Tablelands are cracking clays which allow some acacia to grow, but mostly sustain tussock grasses. The rest of the state is shallow sand over stone or nearly solid subsoil. The north-south highway actually passes along a corridor of scrub for most of its length. As one approaches the Top End, increased precipitation allows some increased variety of plant life. Immediately north of Lake Woods the vegetation changes to scrub and by Daly Waters patchy low eucalypts have appeared. Fauna on the windward, western side of the peninsula tends towards eucalypt, that in Arnhem Land tends towards scrub and cypress pine. Within 300km of the coast, larger eucalypts dominate. Those on the coast become a fairly dense forest. There are any number of exceptions to this pattern. A large section of eastern Arnhem Land, for instance, is barely wooded despite having conditions virtually identical to the surrounding areas. 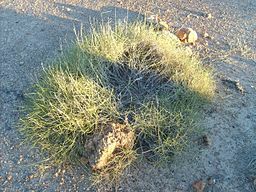 Spinifex is a characteristic tussock grass growing throughout the arid interior of Australia. The term, which literally means 'thorn-maker', most correctly refers to three species of maritime grasses which range widely across Asia and Australasia, but the more popular usage refers to grasses of the genus T riodia. Of the 30-odd species of this genus, T. basedownii (lobed spinifex ), T. pungens (spinifex) and T. irritans (porcupine grass) are the most noteworthy. The former grows in tussocks 30cm to 1m in circumference and, like most Triodia, presents irritating prickles. More mature plants can be recognised by their hollow centre. Its fibrous grass blades can be 2m long. It produces seeds in the spring and these erect oat-like inflorescences are a major food source, fattening range horses. Spinifex's resinous nature makes them highly inflammable. Aboriginal methods of land care involve burning off the spinifex in late spring. The resin is also used as a hafting glue for their spear and axe heads. Porcupine grass is less a monoculture plant and extends as far south as Victoria among mixed grasses. In fact a number of species are commonly called porcupine grass. The Territory's arid conditions inclined its history to one of exploration rather than settlement. Like their exploration elsewhere in Australia, the Dutch kept their charts secret. Arnhem Land (the northeastern area of Northern Territory, now Aboriginal Land Trust) is the namesake of the Dutch yacht captained by Willem van Coolsteerdt who visited briefly in 1623. The first substantial exploration, however, was during Tasman's 1644 coastal voyage from Cape York to Western Australia. Failing to find an expeditious route to their Spice Islands, in what is now Indonesia, the Dutch lost interest. Flinders charted the coast in the Gulf of Carpentaria in 1802-03. Unfortunately, his ship, the Investigator, was in such poor condition that he was only able to make a detailed survey of the eastern coast of Arnhem Land. The remainder of the Northern Territory was charted by Australia's second great cartographer, Phillip Parker King. King visited the area between Cape Arnhem and Cape Leeuwin in Western Australia during his four-year-long voyage between 1818 and 1822. Curiously, he did miss Port Darwin. King pressed for the settlement of the Northern Territory. Exploration by land was similarly late. Explorer Ludwig Leichhardt travelled from Brisbane to the Gulf and northeast across Arnhem Land in 1845. He returned to a celebrity's welcome in Sydney after a 14-month absence. A.C. Gregory followed much the same route in reverse. Starting near the Western Australian border in 1855, he proceeded south first until desert conditions forced him to retrace his steps. By mid-1856 he had crossed the Top End, found his ship had not met the expedition as planned, and proceeded to the east coast. In 1859 J. McDouall Stuart began his efforts to cross the continent from south to north. He required five attempts. The first ended in retreat from aptly named Attack Creek about halfway through the Territory. When the second ended in scrubland 100 miles further north, he wrote, 'The plains and forest are as great a barrier as if there had been an inland sea or a wall built around.' He succeeded in his last effort, reaching the Top End in 1862 after a ten-month slog. In the early 1870s a number of expeditions crossed to and from the western coast to McDouall Stuart's line. Their reports ended speculation about the hoped-for arable centre, inland sea, or navigable interior rivers. In reality, the looked-for inland sea is an exaggeration of the infrequently filled salt lakes in central South Australia; when filled by greater than average rainfalls, these lakes indeed become luxuriant and are brimming with wildlife. Early attempts to settle the Territory were futile. The first settlements, Fort Dundas on Melville Island and at Raffles Bay, were meant to provide an alternative to the Dutch ports which imposed heavy duties. Both were abandoned in 1829 due to tropical diseases, hostile local Aborigines and Timor pirates. Port Essington fared somewhat better. Founded in 1838 in Barrow Bay, it lay so far off the beaten track that visitors could be counted individually. They did include French sailors in a pair of corvettes under Commodore Dumont d'Urville in 1839; Commander J.C. Wickham aboard the Beagle that same year; naturalist John Gilbert was stranded there for a time in 1840 after a cyclone damaged his ship; and Ludwig Leichhardt used it as the westernmost point of his exploration in 1845-46. The settlement was abandoned in 1849. By 1859, following the formation of Queensland and Victoria, the map of Australia gave New South Wales administrative responsibility for an awkward area north and west of South Australia. To solve this discontinuity, either Queensland or South Australia had to be given governance of the Northern Territory. In 1860 it was very nearly named Albert Territory and given to Queensland to administer. Despite A.C. Gregory's expedition across the north in 1855-56, the Queensland government was too busy to bother with the opportunity. South Australian governor Richard MacDonnell became interested largely as a result of McDouall Stuart's reports. For reasons that may have made sense at the time, Queensland's western border was inset about 300km from the South Australian border. Perhaps this three degrees latitude change had something to do with a three-degree addition to South Australia's western border? 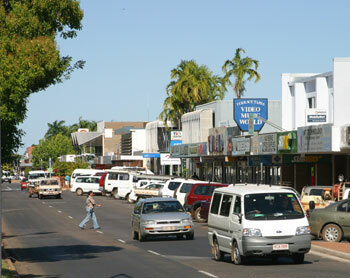 The first town destined for success in the Northern Territory was Palmerston, eventually called Port Darwin, then Darwin. John Lort Stokesnamed Port Darwin after his former ship mate Charles Darwin during a visit to the area in 1839 aboard the Beagle. George Goyder, as South Australian Surveyor-General, had read Stokes's journals and established Palmerston at this location in 1869. It may be unfair to suggest that its success depended upon the Overland Telegraph Line. Suffice it to say, this line necessitated settlements north from South Australia to the Timor Sea. Construction of the Overland Telegraph Line (OTL) deserves description. By 1870 a telegraph service extended across Europe and Asia and Australia desperately needed to establish direct communication. At best, land mail took ten weeks to convey. Proposals to replace the expensive and slow Peninsular and Oriental Steam Navigation Company with a cable terminus at Northwest Cape, Western Australia, or at Normanton on the Queensland coast were flawed by both the extent of undersea cable and the distance from Australia's populated southeast. The South Australian Parliament loaned £120,000 to the OTL; the British-Australian Telegraph Company agreed that all of the Australian revenues would be paid to the OTL but that the line must be completed in 18 months. Recalling that it took McDouall Stuart ten months, it is hardly a surprise that the telegraph company insisted upon substantial penalties for non-compliance. Charles Todd (1826-1905) was put in charge of the project. As (Astronomical) Observer and Superintendent of Telegraph for South Australia, he was an enthusiastic proponent of the undertaking. He had already successfully run the line from Adelaide to Sydney. Subsequent to the line to Darwin, he organised one to Eucla at the South Australian border with Western Australia, establishing direct communication with the entire continent. He also outfitted the Western Australian astronomical observatory. Upon Federation, his postal and telegraph service in South Australia was found to be the only one in the country to operate at a profit. Construction of the telegraph line proceeded along three sections simultaneously. E.M. Bagot contracted for the southern portion through settled country between Port Augusta and the Macumba River near Charlotte Waters. Five government parties working on the central section made a number of discoveries along their way, the most important being reliable water sources for the relay stations. Among these was Alice Springs, named after Todd's wife, Alice Gillam. The settlement's river, usually dry, was also named in honour of Todd himself. Construction of the northern section, however, was hampered by monsoons. The initial contractors proceeded south as far as Katherine River before the rains prevented supplies coming to them. The government's overseer cancelled the contract just as the wet season ended. By the time he had sailed to Adelaide and returned with six ships full of workers and supplies, the rains had returned. After a visit to the area, Todd put railway engineer R.C. Patterson in charge of the frantic effort to complete the line. The submarine cable reached Port Darwin from Banjuwangi in Java in late June 1872. South Australia's line, however, had only reached Daly Waters. The 380km gap to Tennant Creek was crossed by pony express for the first message on 23 June 1872. A problem with the undersea cable delayed normal communication until late October. The land line had been completed on 22 August 1872, eight months into the penalty clauses in the original contract. In our era of radio communication it is difficult to gauge the effect of this first iron line. Even with this telegraphic link to the continent, communication was not instantaneous. Because of the necessary repeater stations, it took two days for a signal to be passed. Among the nine such stations along the OTL, those in the Northern Territory were established as the first continuous presence of European society in the inland regions of the continent. The line itself was a landmark for subsequent surveyors, particularly those from Western Australia. Telegraphic communication between Melbourne and Sydney began in 1858, between Sydney and Adelaide in 1867, and between Adelaide and Perth in 1877. 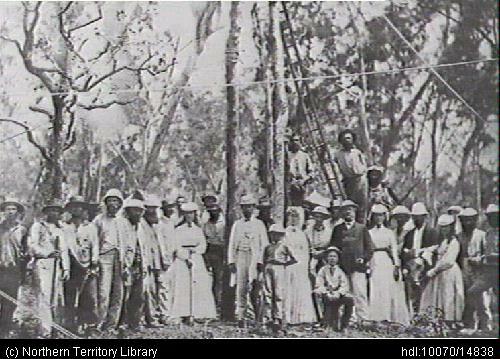 After the Overland Telegraph Line was established, little of historical note occurred in the Territory until Federation. Chinese labour was used during the 1880s to mine gold, but immigration restrictions imposed at the end of the decade resulted in a decline in this population. Some cattle industry started in the Barkly Tableland, but tick fever and drought reduced the industry. In 1909, the Commonwealth bought the Northern Territory's development loans and railroads from South Australia. Under federal administration Palmerston was renamed Darwin. A census conducted at the time counted 3310 people of non-Aboriginal descent in the Territory. Scottish veterinarian Dr J.A. Gilruth was appointed in 1912 as the first Territorial Administrator. His lack of judgement and fairness provoked a stop-work union meeting at the Vestry meatworks in Darwin at which they voted to boycott the state hotels to protest against the price rise for bottled beer. Following the meeting, hundreds of workers marched on government house where they burnt Gilruth in effigy. The central importance of beer in the life of Territorians had already been established. More ready access to the Territory came in the 1930s. Air travel to Europe began in 1934, necessitating fuelling stops in Darwin or Daly Waters. But the construction of the Alice Springs-to-Darwin section of the Stuart Highway had an even greater effect. Under David D. Smith, the road was constructed largely by manual labour supplied by camel train. When reprimanded for exceeding his budget to straighten and widen sections, his defence was 'Too bloody bad!' His anticipation that war would shortly start and that the improved road would be required proved correct. He was put in charge of its upgrade and sealing in 1943. Camels came to Australia as draft animals from the Canary Islands in 1840, but did not become a major import until the 1860s. In 1860, 24 of them arrived from India for use on the Burke and Wills expedition. The first serious camel stud was at Thomas Elder's station at Beltana, South Australia. This station, by the way, was the basis for the multinational firm Elders IXL. Between the 1860s and 1907, imports may have been as many as 12,000 head despite a number of breeding herds in Australia. The camel herdsmen were imported as well. These 'Afghans', as Australians would have the term, came from throughout western Asia, but predominantly from Peshawar in present-day Pakistan. The caravans supplying stations and settlements beyond the railheads were generally comprised of 40 camels under four handlers. They routinely covered about 40km per day; the camels carried around 500kg each, depending on the breed. They were tremendously important to the exploration and development of vast areas of the inland. As late as 1912, they were used as water-carriers for the building of the Trans-Australian Railway, and were still used as pack animals in the 1930s. As motor transport came to dominate, camels were simply left to run wild in the outback. A current resurgence in interest in camel-raising is due to their relatively unobtrusive effect on semi-arid pasturage. The Japanese attack on Pearl Harbour caused the evacuation of women and children from Darwin. The first of about 60 bombings of Darwin during the Second World War occurred on 19 February 1942. It was the most effective of the war, resulting in 10 ships being sunk in Darwin harbour, 250 individuals killed and 320 injured. During the war nearly half of the town's buildings were damaged. Darwin was the only place in Australia to be repeatedly attacked by the Japanese. It is this period, 1937-43, that author Xavier Herbert treats in his epic novel Poor Fellow My Country (1975). Herbert had earlier written Capricornia (1938), the name he gave to Northern Australia; here he describes the Territory's history as 'more bloody than that of the others'. The one great improvement to come out of the war was the sealed roads from the south and the east, and improved communications with the rest of the country. Since the Second World War, the Northern Territory has developed in terms of pastoral and mining industry, although the population still remained small. Darwin came to world attention in 1974, when, on Christmas Day, Cyclone Tracy destroyed most of the town, killing 66 people and leaving thousands homeless. The evacuation of these survivors by Qantas Airlines, with 674 passengers on one flight, still ranks as one of the largest mass air evacuations in history. Within four years, Darwin had been completely rebuilt. Today, the Territory's greatest industry, and a booming one, is tourism, as it is the gateway to the 'real' Australia: the Red Centre, the outback, the beauties of Kakadu and Uluru. Alice Springs' population has grown from a little over 1000 in the 1950s to more than 20,000 entirely as a result of tourism. The benefits of this influx of new people and new ideas have been substantial, although the Territory's limited population still leads to its marginalisation in terms of Australian politics and mainstream affairs-a situation that leads to the sense of transience and difference that is part of the Territory's charm. The State's Tourism Department has taken great strides to make its web presence comfortable and thorough. 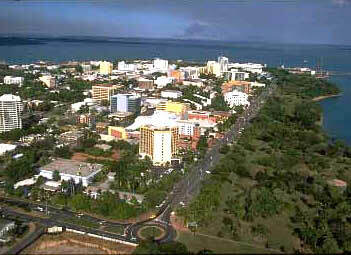 Darwin (population 80,907) sits on the edge of the Timor Sea in the Northern Territory's coastal northwest. Much of its architectural history has been destroyed by cyclones, most notably those in 1897, 1937 and 1974. This fact, coupled with the city's proximity to Asia, has led to a major attitudinal transformation beginning as early as the 1980s. Darwin has become a racial melting pot, with its focus turned towards Asia; in many ways, as a recent article in the Sydney paper stated, Darwin 'has been transformed into a bustling, if small, South-East Asian town'. This may be a bit of an exaggeration, but the ethnic mix of the population certainly substantiates such a claim: the town is home to more than 60 ethnic groups, with mixed marriages quite common and intriguing cultural festivals emphasising these new combinations. The food markets dotted around the city offer the greatest evidence of Darwin's strong Asian flavour. It is important to remember that Timor is only one hour away by plane, and even Malaysia is a shorter distance than Sydney. Many of the city's businesses are owned by Indonesia's leading families, and the Sultan of Brunei owns three large cattle properties nearby. One-quarter of the Territory's small population is Aboriginal, a much higher ratio than anywhere else in Australia. The image of Territorians as beer-swilling red-necks is becoming increasingly dated; as the Territory's former Chief Minister Shane Stone has said: 'It is the southern cities that have ethnic ghettos; we have one of the most free-flowing racial communities in the world.' With 25 being the average age in the city, Darwin does express a different outlook than the rest of the country: the tropical climate, and the isolated location, do contribute to a feeling at times of transience and 'no worries' inconsequentiality. The atmosphere of Darwin, in its various directions, can best be seen in the city's Festival of Darwin, held in August, and including plays, musical performances, art and other activities; and, most famously, in the Beer Can Regatta, also in August, with boats made entirely of beer cans. the mall; and the old courthouse and police station (1884) at the end of Smith Street on Esplanade. In fact, these buildings are not as interesting as those designed in the late 1930s by B.C.G. Burnett (see below). 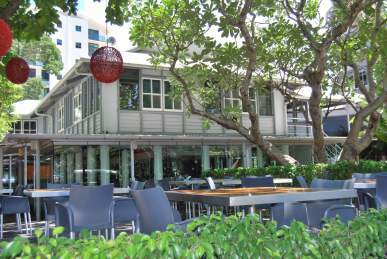 Admiralty House (now a restaurant) on the southeast corner of Knuckey Street and Esplanade remains from the 1930s as do some houses on Myilly Point. Nearly all of the dwellings and most of the commercial and governmental buildings were destroyed when Cyclone Tracy struck on Christmas Day in 1974. Heroic efforts by emergency services prevented widespread tragedy. In the end 49 people died as an immediate result of the storm rather than in its aftermath. The town was rebuilt, another heroic effort, with marked respect for the inevitable cyclones making the architecture somewhat blockish. The city is fairly small and quite flat. Bicycles are readily hired and the bike paths are well maintained. The STUART HIGHWAY enters Darwin proper from the northeast, becoming Daly Street. Wharves and marinas are south and east of the city centre. 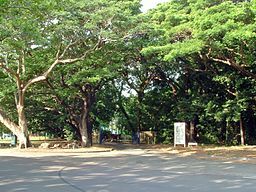 To the north of Daly Street along EAST POINT ROAD are Palmerston Park, the golf course, Mindil Beach Reserve, the Botanic Gardens and the museum and art gallery. The city centre has a large pedestrian mall with governmental buildings mostly to its south near the harbour. An esplanade skirts the beaches. The Botanic Gardens (free admission, t 08 8999 4418; open daily Gardens 7.00-19.00, Display House 8.30-13.30) are immediately north of the city centre and accessible by car off the Stuart Highway on Geranium Street or by bus no. 10 to Casuarina or no. 8 to Palmerston from the city centre to Tucker Hut Inn and left at the next corner. The gardens were started by Maurice Holtze, a German hired in the 1870s to establish a fruit and vegetable plantation. Not surprisingly, Cyclone Tracy ravaged the garden's trees and shrubs, but the tropical collection has since been admirably re-established. The new water fountain and its incredible cubbyhouse in a fallen tree are recommended by visiting children. The National Trust has two buildinging in Darwin open for visits, most noteable is Burnett House (admission free, Mon.-Sat. 10.00-13.00, Sun. 15.00-17.00, t 8981 0165) at the Audit House (9.00-14.00, open ocassionally for events) edge of the Myilly Point historic district immediately south of Mindil Beach. 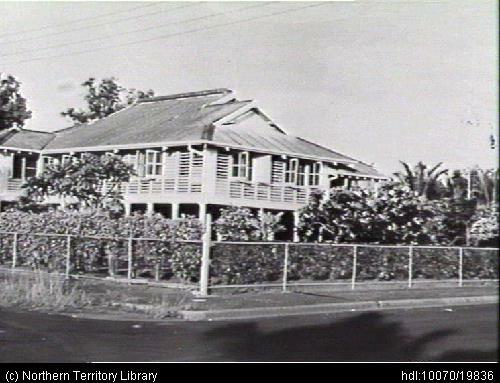 The Trust's offices are at Although Cyclone Tracy destroyed nearly all of the domestic buildings in Darwin, this district's dwellings from the 1930s were largely spared. Beni Carr Glynn Burnett, an architect who had worked for some years in China, came to Darwin in 1937 as the Territory's Principal Architect. He designed the houses on this elevated point to take advantage of the sea breezes. The houses are elevated and have louvres for their casement windows. The internal walls are three-quarters height and have lower louvres as well as openings in the eaves. In addition to the National Trust in Burnett House, another Burnett-designed house on Burnett Place is open as a gallery and cafe. Mindil Beach Reserve (bus nos 4 or 6) is best visited on Thursday night during the dry season for its elaborate market and food stalls. The al fresco cuisine is unsurpassed and the atmosphere worth the trip itself. Similar food stall markets are found on Saturday morning at the Parap market (further north, bus no. 6), on Sunday morning in Rapid Creek (a suburb north of the airport which hosts the Mindil market during the Wet, bus no. 4) and in the central Smith Street mall every evening except Thursday. 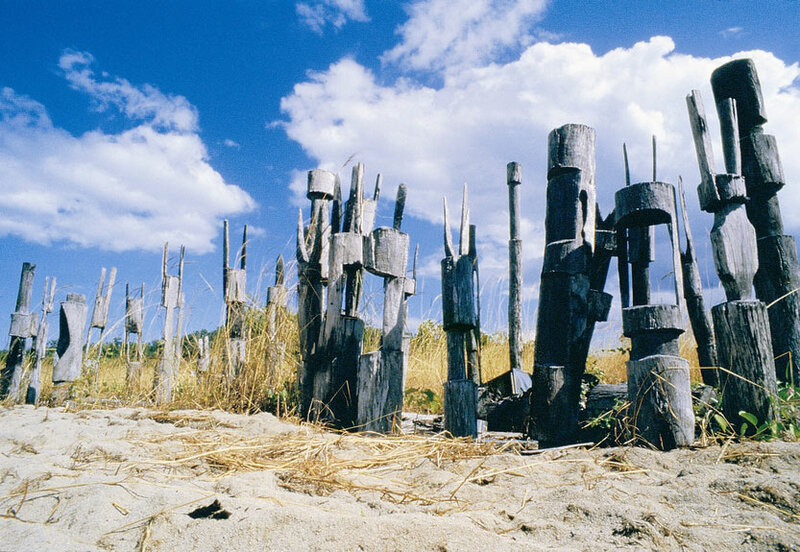 On the beach is an interesting bamboo-and-cane sculpture by Hortensia Masero, created for the Festival of Darwin, which takes place every August. 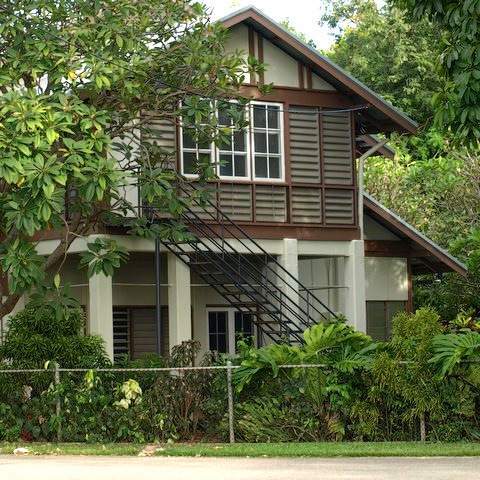 The Museum and Art Gallery (admission free, 08 8999 8264; open weekdays 09.00-17.00, weekends 10.00-17.00) is in an oceanside park north of Mindil Beach Reserve off East Point Road. It has a remarkably good collection representing regional Aboriginal and Torres Strait Island culture, an ambitious maritime display presenting a number of vessels. The natural history display includes a graphic description of Cyclone Tracy's effects and the national response to the devastation it wreaked. Local pride in the ethnic community is expressed, particularly in a display of a Malaysian prahu (a marine houseboat) and a Japanese pearling lugger. The museum also administers the Australian Pearling Exhibition, located directly on the left upon entering the Stokes Hill Wharf. In addition to a video describing pearl oyster farming, its displays feature the early history of pearling in the region. The Darwin Regional Tourism Association (t 1300 138 886) is in the mall at 6 Bennett Street, around the corner from the Mall. The Northern Territory Parks and Wildlife (t 08 8999 5511) can be helpful as well. The Darwin Bushwalking Club (t 08 8985 1484) welcomes visitors and offers advice on walking tracks in Litchfield National Park and Kakadu, among others. Day trips from Darwin include visits to Litchfield National Park (t 08 8976 0282, 115km south); and flights or ferry to the Tiwi people (see below) on Melville and Bathurst Islands. 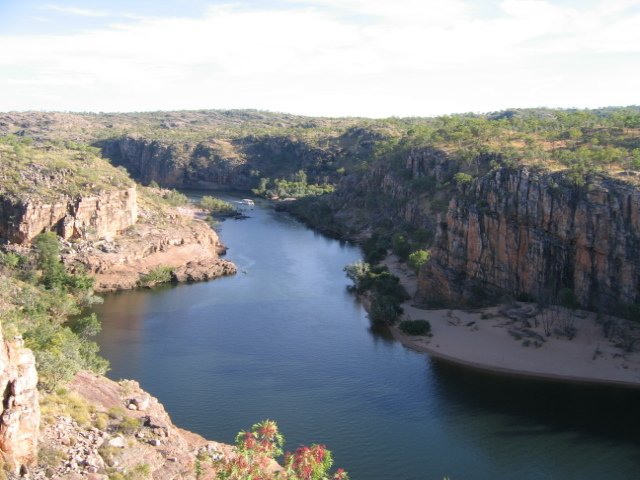 Longer tours to Peppimenarti and to Manyallaluk (near Katherine Gorge) are available. The Northern Territory Tourist Commission in Darwin and the Northern Territory Police have considerable information on these and other organised Aboriginal cultural experiences. The traditions on the islands are still quite intact, largely due to the Tiwi's independent character. They had a history of hostility towards the Macassan who came to fish for trepang (sea cucumbers) from Sulawesi, formerly the Celebes, as early as the 17C. Their relations with the British who attempted settlements at Fort Dundas and Raffles Bay were cool as well. Both settlements were abandoned in 1829. In the late 1890s, Joe Cooperand Paddy Cahill hunted buffalo on Melville Island. They were chased off, but Cooper eventually returned to live there for 16 years. Initially, the Catholic Church mission on Bathurst Island received little support, reputedly because the Tiwi were suspicious of priests without wives. AATKings Travel (866 240 1659) offers tours via air or ferry from Darwin to Bathurst Island for tea with local women, a visit to the local museum and craft center and to the pukumani burial site. The burials are marked by poles which are painted, carved and erected as part of the final funerary ceremony in which the spirit of the deceased is released. 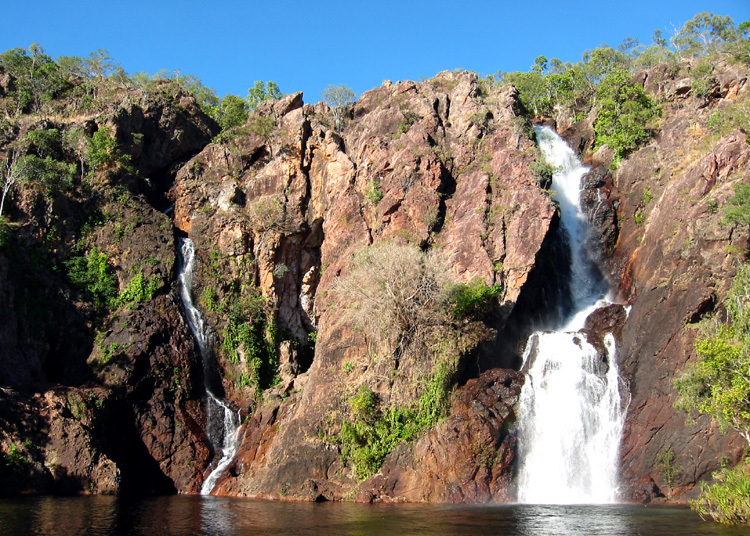 Litchfield National Park is less than two hours' drive (115km) south of Darwin on the STUART HIGHWAY. Its proximity to Darwin makes it a local favourite, so the park can be somewhat crowded on holiday weekends. Sandstone cliffs at the edge of a plateau separate the park's two major ecological areas and produce a number of spectacular waterfalls. Atop the plateau is an open eucalypt forest, and there are pockets of rainforest throughout the park. 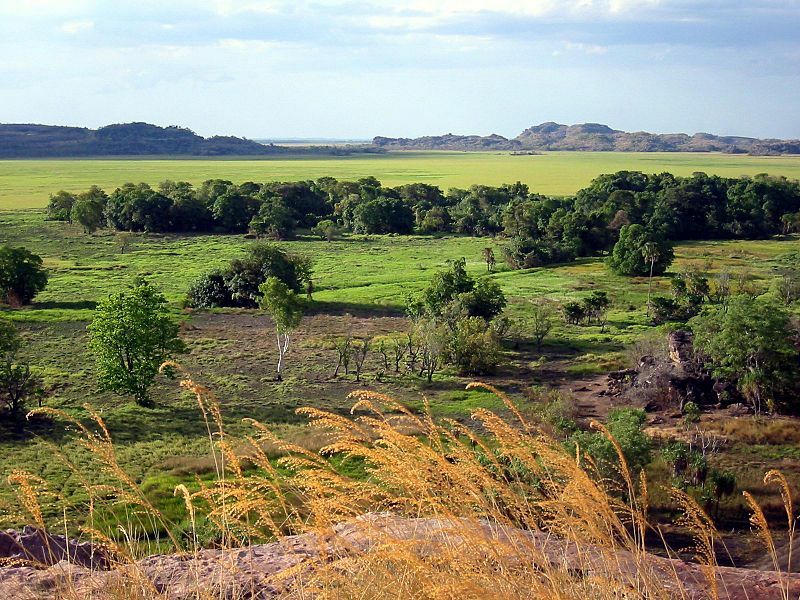 Below the escarpment is a black soil wetlands noted for speargrass of the Aristida genus, a tall bright green grass in growth and a pleasant straw colour during the dry season. Florence, Tolmer and Wangi Falls are the most accessible of the park's waterfalls. Shortly after entering the park from the east, via the town of Batchelor, a display and boardwalk present the flood plain and magnetic termite mounds. These termites have built above-ground nests as an adaptation to the high water table and flooding during the summer. The wedge shape and north-south orientation of the mounds are to cope with daily temperature changes. At night the insects congregate in the middle of their mound; during the day they move to its cooler eastern side. Beyond the mounds the road climbs the escarpment at Aida Creek Jump-up. About 6km along is the turn-off to Florence Falls. Here a boardwalk suitable for wheelchair access leads to a spectacular lookout. Below, the exuberant rainforest and a swimming hole at the end of the steep path to the cascade's bottom make this an attractive stop. About 9km from Florence Falls is Tabletop Swamp, a good wetland for bird watching and a picnic site. A number of the park's sites are along tracks accessible to experienced drivers of all-terrain vehicles. The most notable is arguably the Lost City, a jumble of natural sandstone pillars and blocks. Tolmer Falls, about 14km beyond Florence Falls, has a good boardwalk, providing wheelchair access to its view as well. The cascade and pools immediately around its base are inaccessible to protect a number of bat species nesting here. The most popular site in the park is Wangi Falls (pronounced wong guy). These flow strongly year round and cascade into a large pool which is suitable for swimming except during periods of high water. Kakadu and Uluru are World Heritage Sites for their natural setting and association with Australia's Aboriginal traditions. The land rights of the associated Aboriginal communities are recognised in both cases, each area being governed by its traditional owners. Excellent tours of Kakadu are organized by Parks Australia during the dry, May - September. Kakadu National Park (t +61 8 8938 1120) encompasses nearly all of the South Alligator River system, 22,000 sq km in all. Its World Heritage Listing in 1984 came as a result of the second stage of its formation. In 1979, the eastern and central sections of the park were ceded. These had been the Woolwonga and Alligator River wildlife sanctuaries, set aside in 1969 and 1972. Finally, in 1991, the southern sections were listed. Some of this area is being claimed by the Jawoyn people in adjacent Katherine Gorge. Should they be awarded the claim, they will receive financial benefits and representation on the board of management. Captain Philip King was the first European to enter the area. During three voyages between 1818 and 1822 to complete Matthew Flinders' exploration, he travelled up the East and South Alligator Rivers. He named the rivers, mistaking the local crocodiles for alligators. Ludwig Leichhardt crossed the Arnhem Plateau and South Alligator River on his exhausting 14-month-long trip from the Darling Downs in Queensland to Port Essington. A short-lived gold rush to Pine Creek, immediately southwest of the park, and the first pastoral leases in the area brought some Europeans here in the late 1870s. From the 1890s to the present, feral water buffalo were hunted at first for skins and since the 1950s for sport. These animals are the descendants of those released upon the abandonment of military settlements at Raffles Bay and Port Essington on the Cobourg Peninsula and from Escape Cliffs. Baldwin Spencer was the first anthropologist to describe the Aboriginal culture of the area. In a visit to Oenpelli on the Arnhem Land plateau in 1912, he described a nearby rock art site: The slanting roofs and sides [of the rock shelter] were one mass of native drawings, precisely similar to those done on bark, but here, the rocks had been blackened for long years by the smoke of countless camp fires and the drawings, most of them fishes, had been superimposed on one another, the brighter colours of the more recent ones standing out clearly on the darker background. Subsequent work by anthropologists N. B. Tindale and, most notably, by Charles P. Mountford in the 1920s and 1930s brought the region's art to the attention of an international community. 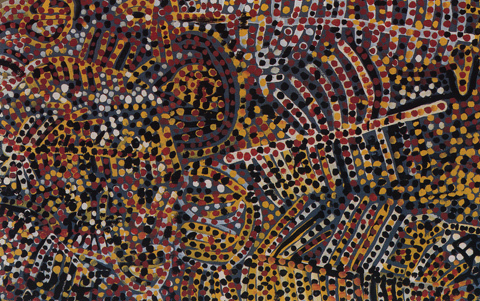 The 1954 UNESCO World Art Series was possibly the first to disseminate widely Aboriginal images to the world at large. 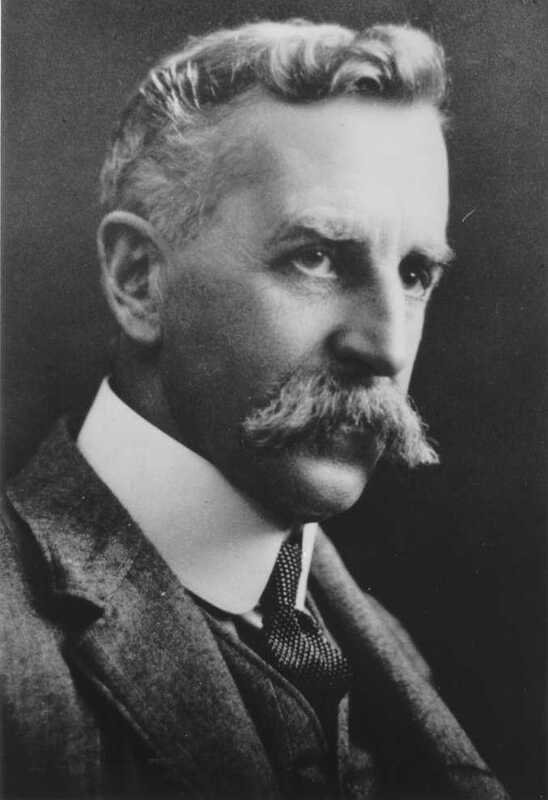 Sir Walter Baldwin Spencer (1860-1929) began his career as a biologist, after graduating from Oxford and being appointed to the professorship of biology in Melbourne in 1886. Spencer's indefatigable curiosity and scholarly energy led him to join the first expedition of Central Australia, under W.A. Horn, in 1894. Here he met the remarkable F.J. Gillen (1855-1912), a government employee who had steeped himself in knowledge of the Central Desert's Aborigines, their language and their customs. Gillen was called 'Oknirrabata', or 'great teacher', by the Aranda tribe. Spencer and Gillen began the first in-depth anthropological study of these tribes, producing in 1899 the ground-breaking Native Tribes of Central Australia. Spencer continued his academic duties in Melbourne, while carrying out additional field-work in the Northern Territory in 1901 with Gillen, identifying previously unknown Aboriginal tribes and languages; these studies resulted in the book The Northern Tribes of Central Australia (1904). In that same year, Spencer became President of the Board of the University of Melbourne, and in 1911, he was asked by the Commonwealth Government to lead an expedition into the Northern Territory to enquire into conditions of the Aboriginal inhabitants; his report, again with Gillen, was the two-volume Across Australia (1911), another pioneering achievement. 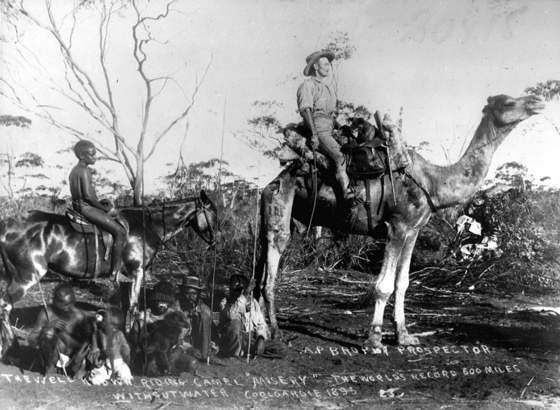 In 1912 Spencer became Chief Protector of Aborigines and in that capacity carried out further exploration of unknown tribes and outback regions. Throughout the 1920s, he continued to publish important works on Aboriginal life and customs. In that decade, he turned his attention to the study of the natives of Tierra del Fuego; on an expedition there in 1929, at the age of 69, he died. While much of Spencer's work has certainly received critical revision in subsequent anthropological studies, his initial achievement in identifying Aboriginal material culture, languages, and social customs remain as an extraordinary accomplishment, and established the discipline of anthropology in Australia. Tim Rowse's essay 'Moralising the Colonial Past', reviewing recent histories of Australian anthropology, is a good start toward understanding early relations between colonial and indigenous people. Uranium was discovered in Kakadu in 1953 and four large deposits were found in the early 1970s. The very real dangers the proposed mines pose was controlled until the recent Liberal government put aside the previous Three Mines policy. Fortunately, the prevailing low price of uranium makes development a legally symbolic gesture rather than a fiscally prudent operation. The park contains four major landforms: the Koolpinyah plains, the coastal riverine plains, the Arnhem Land plateau and escarpment, and some southern hills. Extending from Darwin to the Arnhem Land escarpment, the Koolpinyah Plains are gently undulating Late Tertiary deposits of heavily weathered Mesozoic sediments. Comprised of gravels, sands and clays, the soils at the surface are relatively infertile, having been leached of minerals and alkali earths. Accumulations of iron and aluminium further reduce the fertility. The proliferation of iron creates the characteristic ironstone found as broken pavements or outcrops at the headwaters of creeks. The associated stands of tall trees are the Darwin stringybark and Darwin woolybutt eucalypts, with an understorey of ironwood and green plum, pandanus palms and extensive and fast-growing tall grasses, the most prevalent being spear grass. The more prevalent lowland forests grow on heavier, less well-drained soil. The eucalypts here are markedly stunted and scattered amid sparse shrub and annual grasses. 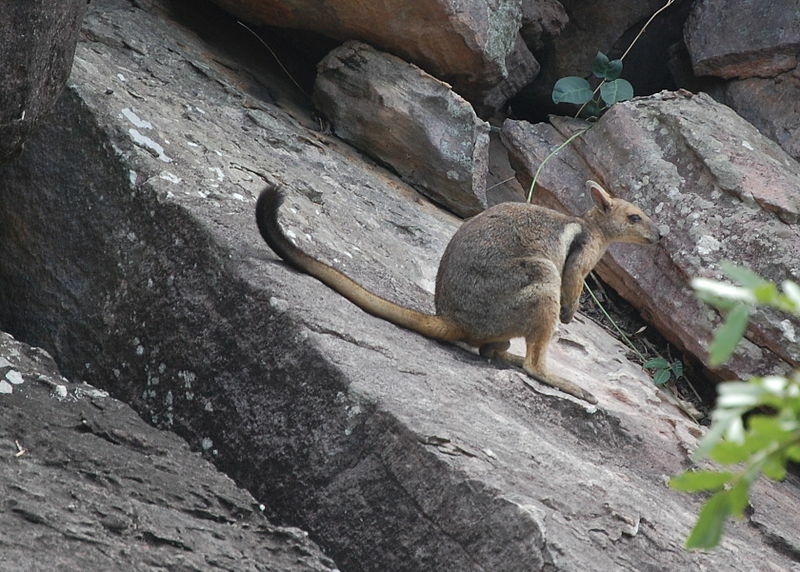 This habitat supports a variety of wallaby and wallaroo, as well as nocturnal sugar gliders, brushtail possums and quolls. 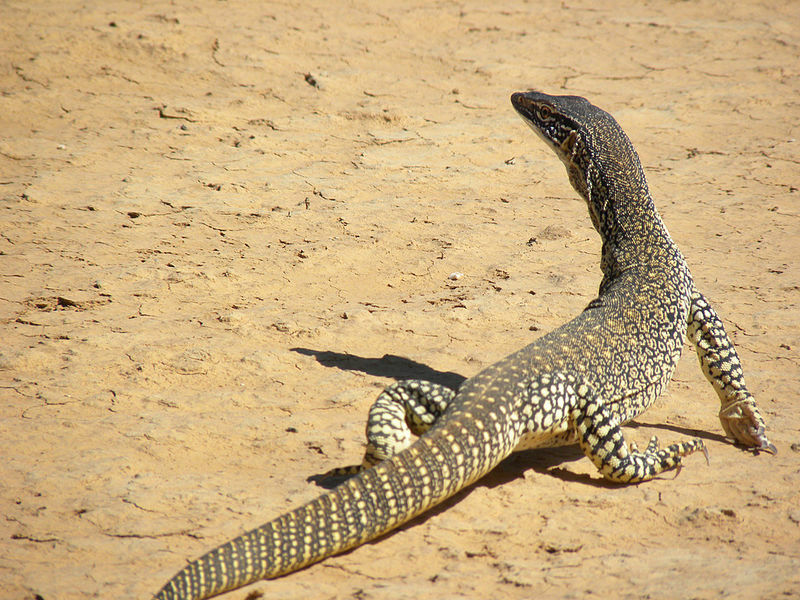 A variety of skinks are routinely sighted as are sand goannas. The well-known frilly-necked lizard, though present, is elusive. Bird species include lorikeets, yellow-tailed and red-tailed black cockatoos, rainbow bee-eaters and a variety of kingfishers. In addition to the gentle slope northward to the sea, two other features of these plains are sinkholes forming seasonal or permanent bodies of water and, of course, the five rivers in the park. These flow strongly during the seasonal rains and dry out to a string of billabong wetlands by the end of the dry season in their inland reaches. The most accessible wetland areas are Mamukala a few kilometres east of the South Alligator River; Yellow Water and associated billabongs near the Warradjan Cultural Centre; and Ubirr in the northeastern part of the park. Their signal trees are broadleaf and weeping paperbark eucalypts, freshwater mangroves, pandanus and water lilies. In addition to endemic species, the less commonly seen magpie geese, shining flycatchers and black-necked storks frequent these freshwater wetlands. The coastal riverine plains tend to be black organic clays associated with tidal or flood plain estuaries on the Magela, Nourlangie and Jim Jim Creeks and the South Alligator River. Most of these areas are flooded four months of the year, some as many as nine months. Like the Kimberley region in northern Western Australia, the tides here are remarkable. The 5- to 6m rises in the spring extend 105km upstream on the South Alligator River. The associated coastal monsoon rainforests are marked by banyan, kapok and milkwood trees. The geological history of this landform dates from the end of the last ice age. About 14,000 years ago the sea level was some 150m below the present level and the shoreline was more than 300km north. By 6800 years ago, the sea level was more or less as it is currently. During the next 500 years, mangroves developed along the rivers until sedimentation reduced the marine effects upriver and freshwater swamps and wetlands began to appear. This process continued until quite recently, the Magela flood plain being formed as recently as 1300 years ago. The Arnhem Land Plateau and Escarpment is of quartz sandstone with drops of up to 330m to the adjoining plains. Largely confined to inaccessible areas in the park's southeast, it is more readily viewed at Katherine River Gorge. Soil is absent from large areas of the plateau, sand deposits being interspersed above the Cretaceous bedrock. Eucalypt woodland is interspersed with spinifex grasslands and scrubby heath. Acacia and grevillea blossom in the early dry and throughout the wet season. Associated animal life includes Pamela's and Jewelled velvet geckos, skinks, white-throated grass wrens and chestnut quilled rock pigeons. Both birds are unique to the area. As elsewhere along Australia's coastal regions, the white-bellied sea eagle is an important predator of the smaller marsupials. The joints, faults and dykes of the Arnhem Land Plateau make the plain act as a major aquifer from which the South Alligator and Mary Rivers spring. The permanent springs in the gorges create monsoon rainforests of evergreen allosyncarpia. During the dry season these areas are well frequented by bird species. Those largely confined to the park and its immediate surrounds are the rainbow pitta, orange footed scrubfowl and the Torresian imperial pigeon. Archaeological evidence suggests that Aboriginal people came to Kakadu between 40,000 and 60,000 years ago, the latter figure being the more likely. They would have come in the late Pleistocene period from the Indonesian archipelago. Archaeologists debate the circumstances of the earliest arrivals, basically relating fluctuations in sea levels with methods of dating which use radiocarbon and optically stimulated luminescence. If the Aboriginal population crossed during low sea levels around 70,000 years ago, the crossing would have been between 60 and 100km. If rising sea levels had provided impetus to develop watercraft, the most likely date would have been about 60,000 years ago or later across distances not unlike those existing at present. By 20,000 years ago the Kakadu residents were making sophisticated stone tools including one of humankind's earliest examples of hafted edge-ground axes. From about 8500 to 7000 years ago the sea level rose, forcing the population off the coastal region onto the Arnhem Land plateau during a period of increased rainfall. The current flood plain developed between 4000 and 1500 years ago. In the last 1000 years the Aboriginal population increased dramatically as they became adept at using the resources of this freshwater environment. Immediately prior to European contact, the area now defined as Kakadu Park probably supported 2000 people. 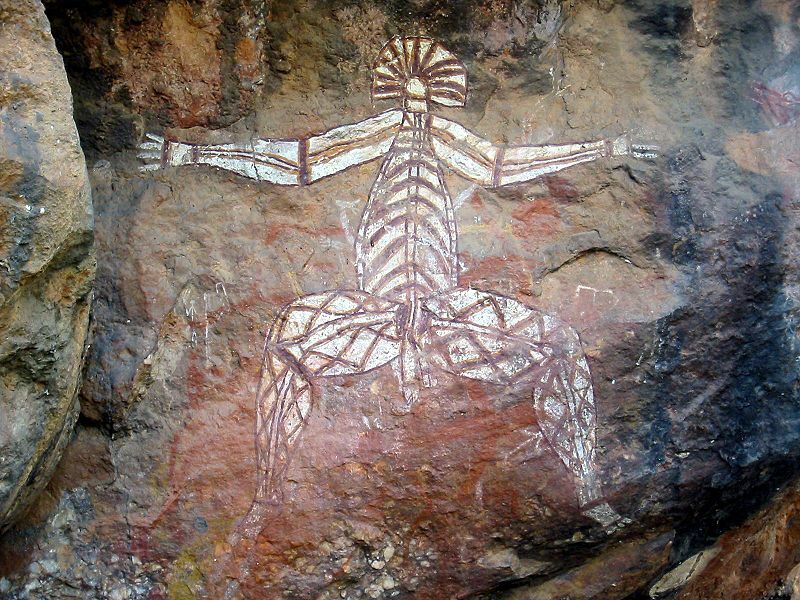 The rock art in Kakadu follows a typical sequence for indigenous art in Australia. Large quantities of ochre have been found around rock shelters which date to as early as 20,000 years ago, suggesting that the same people who made the edge-ground axes decorated their walls as well. Images from the immediate post-glacial period of rising sea levels do exist. Chronology of the succeeding styles relate them to the effects of climate on the area's flora and fauna as well as the chemical changes in the pigments and rock surfaces. George Chaloupka summarises the stylistic changes in Kakadu in the 'Rock Art of the Northern Territory' in The Inspired Dream (1988), a catalogue of an exhibition presented at the Queensland Art Gallery in Brisbane. The styles of rock paintings are grouped as pre-estuarine (before 8000 years ago), estuarine (8000 to 1500 years ago), freshwater (since 1500 years ago) and contact (following Macassan and European contact in the last 300 years). The greatest number of pre-estuarine art dates from 20,000 to 8000 years ago. Its earliest images are prints of hands followed by naturalistic depictions of kangaroos and wallabies at about 18,000 years ago. Interesting to palaeontologists, these images include now extinct megafauna (large echidnas and wombats). Later in this period the images present human activities such as men with hunting implements (boomerangs and hooked sticks) and women with digging and fire sticks and stone axes. Initially the style was quite representative and dynamic, but the depictions became increasingly stylised and abstracted. Towards the end of the period human and animal figures become more stylised. By the end of the pre-estuarine period, yam figures and the Rainbow Snake Being occur. In common with the art of the Kimberley region (see p 577), yam figures become increasingly important in art, while human figures become more stylised as the rising sea levels forced the people further south. By about 8000 years ago the Rainbow Serpent begins to appear, indicating a new and unifying mythology coming to the area. Currently, the Rainbow Snake is associated with rain and floods in which the serpent rises from the sea and eats people. Fish are also increasingly depicted as the technology changes from hunting to fishing. The estuarine period commenced during the climatic change at the end of the last ice age. Sea levels rose to isolate Australia from Papua New Guinea and Tasmania from the mainland and the current monsoon pattern emerged here in the north. Once the x-ray style of depiction becomes prevalent (about 1500 to 1000 years ago), the freshwater period is fully established. Namarrgon, 'Lightning Man', also appears as the climate of the wet becomes the norm. During this period, the food sources of the Aboriginal population became truly aquatic. These foods were depicted in readily recognisable fashion and include jabirus, waterlilies, magpie geese and a number of fish. The didgeridoo is first depicted at this time. While the European calendar divides the year into a dry winter, from May through September, and a wet summer, from November through March, not surprisingly, the Aboriginal people resident in Kakadu and the surrounding region have much finer distinctions for the seasons. The pre-monsoon storm season, Gunumeleng, begins in October when the humidity and temperature rises and spectacular thunderstorms begin; fruit trees are bearing at the beginning of this season. Gudjewg, the monsoon season, begins in late December and the water apple bears fruit in early January at the beginning of the heavy rains. By the end of the monsoon season about 1300mm of rain will have fallen. One year in ten will bring a cyclone. In February the plains are flooded, though some occasional fine hot spells can be expected. The magpie geese begin laying. The last of the storms begin in March at the onset of Banggereng. 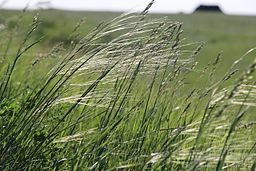 These come from the southeast and their strong winds knock down the tall seasonal grasses. A cooler, humid season begins in late April, Yegge. The green grasshoppers are calling, the yams are ready for harvest and the tourists start arriving in force. At the end of Yegge, in mid-June, it is time to start lighting fires to burn off the ground vegetation. This burn off causes spectacular sunsets. The woollybutt trees blossom at the start of Wurrgeng, a relatively cool weather season between mid-June and mid-August. By the start of Gurrung, mid-August, when the fruit trees begin blossoming, the weather has become hot and dry. A number of deciduous trees lose their leaves to preserve water. The blossoming of the water apple signals the end of this season. Travel in the park is via the Arnhem Highway crossing west to east and the Kakadu Highway crossing southwest to northeast. The former runs more or less east to west for 247km between Darwin (its junction with the Stuart Highway is 43km south of Darwin) and the park's only town, Jabiru. 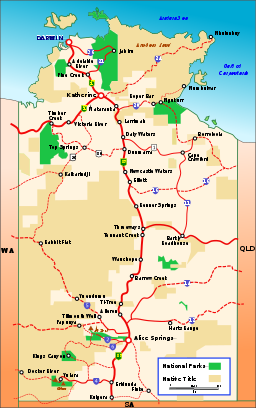 The Kakadu Highway is diagonally southwest, northeast from Pine Creek on the Stuart Highway and the western areas of the Arnhem Land Aboriginal Land Trust. While these roads are sealed and passable in all seasons by two-wheel-drive vehicles, a number of secondary roads leading from them require four-wheel-drive, particularly in the wet season. Entering the park after a rather uneventful 210km drive across a low eucalypt scrubland from Darwin, the first river crossed is the Wildman River. Shortly thereafter, a track north leads to popular fishing and camping sites at Two Mile Water Hole on this river, an 8km trip passable by conventional vehicles in the dry. A further 38km leads to Four Mile Water Hole, but this track is only passable by four-wheel-drive vehicles. The next river crossed is the West Alligator, then its West and East branches. At about 37km into the park a track south leads to camp grounds at Alligator Billabong and Red Lily, Bucket and Leichhardt Billabongs. A four-wheel-drive road leads from Alligator Billabong to the Old Darwin Road near Kunkamoula Billabong. Even in the dry season, all of these tracks are difficult. 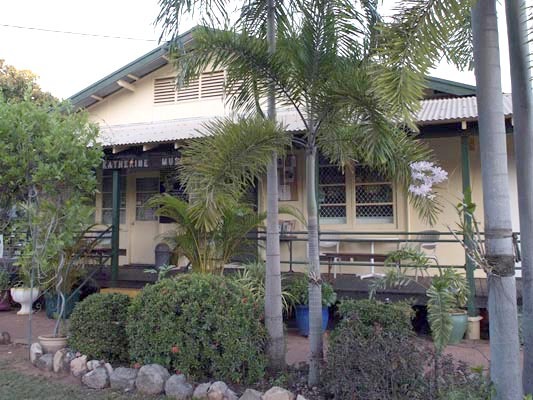 Kakadu Holiday Village (t 08 8979 0166) is about 43km into the park, just west of the South Alligator River. About 10km beyond Kakadu Holiday Village a short way south of the highway is a favoured bird-watching area at Mamukala. Here a 3km easy walking trail with bird hides and an observation building allows access to the flood plain of the South Alligator River. The wetlands bird species of the park are plentiful here, especially in the dry season. A second walk, the Gu-ngarre Monsoon Rainforest Walk, is somewhat shorter and passes through monsoon rainforest and woodlands. The pamphlet on Aboriginal plant use available from the Bowali Visitor's Centre makes possible plant identification along this easy walk. The park headquarters and Bowali Visitor's Centre (t 08 8938 1121) is just beyond Gu-ngarre, 80km into the park at the junction of the Arnhem Highway from Darwin and the Kakadu Highway just west of Jabiru, the park's single town. This company town, with an airport, was built to service the adjacent Ranger Uranium Mine. In town is an Olympic-sized public swimming pool and a nine-hole golf course. The best published guides to the park are available at the Visitor's Centre. Also available here are schedules for the excellent walking tours of the rock art sites at Obiri Rock and Nourlangie Rock and of the areas around the major natural sites. The Gagudju Crocodile Hotel Kakadu, Flinders Street, Jabiru (t +61 8 8979 9000) is also known simply as the Crocodile Hotel for being shaped like a crocodile (you enter through its mouth). An Aboriginal-owned luxury hotel, its shape is a reference to the myths of the Gagudju people. Like the Crocodile Hotel, the Kakadu Frontier Lodge and Caravan Park (t +61 8 8979 0166) was designed with Gagudju advice which gave rise to its circular shape. The track north from the park's information centre leads 43km to Ubirr, site of some of Australia's finest rock art. The art may be seen at the end of an easy 1km walk to Obiri Rock. The entire historical range of styles is evident here, including depictions of extinct thylacine (Tasmanian Tiger), stick figure spirits called mabuyu, x-ray-style brush-tailed wallabies and post-contact European figures. The Rainbow Serpent and Namarkan Sisters paintings have particularly interesting mythologies. Following a short, steep track to a lookout provides a view of the East Alligator River flood plain. Other walks in the area are the Manngarre Monsoon Rainforest Walk (about an hour mostly on a boardwalk from the boat ramp downstream from the Border Store) and the Bardedjilidji Sandstone Walk. This latter walk is 2.5km long and starts from the car park near the upstream picnic area. It traverses some wetland areas and leads to sandstone formations geologically related to the escarpment. The Guluyambi River Trip (t 1 800 525 238), which departs from the boat ramp below the Border Store, lasts about two hours. Aboriginal guides describe their relationship between the land and their culture. The fairly small boats make the trip seem quite personal and the guides are engaging. 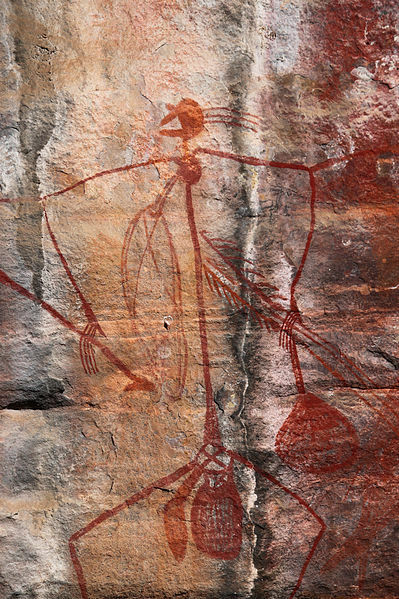 Australia's most famous rock art gallery is at Nourlangie, 31km from the park's headquarters south off Kakadu Highway. Two galleries are open for view, one at Nourlangie and the other at Nanguluwur. A fairly easy 4km return walk from Nourlangie leads to Nanguluwur Gallery, a much less frequented site with significant post-contact images, as well as post-estuarine x-ray-style painting and hand stencils. The principal site at Nourlangie is the Anbangbang Rock Shelter, which is 1.5km from the car park and wheelchair accessible. The mythical figures Nabulwinjbulwinj (seen at left), Namarrgon (Lightning Man, an insect-like figure who produces lightning by striking rocks with axes protruding from his head and joints) and Barrkinj (Lightning Man's wife) at Anbangbang Rock were repainted in accordance with tradition in 1963-64. The famous realistic painting of a sailing ship with its trailing dinghy is at this site as well. In addition to walks to the rock art sites, the area has a number of nature walks. Nawulandja Look-out is a short track uphill to overlook the Nourlangie Rock. The Anbangbang Billabong hosts a picnic area with a 2.5km track around the billabong. The Barrk Sandstone Bushwalk is a 12km, 6-hour strenuous walk to the top of Nourlangie Rock. In fact, it is the only long walk along marked trails in the park. Should you wish to take any other independent bushwalks, you are required to inform the rangers at the park headquarters of your itinerary. Further south on the Kakadu Highway is the turn-off to Jim Jim Falls. Although the track leading to the falls requires four-wheel-drive and the short walk to the falls is something of a scramble over and around boulders near the base of the falls, the 215m cascade and swimming hole at their plunder pool are well frequented. Because the flow from the escarpment gradually lessens and even ceases as the dry period proceeds, the area is best visited as soon after the road reopens as possible. Even in the dry period of the year (The Dry), the surrounds and gorge at Jim Jim Falls are worth the effort. Twin Falls, which can be counted on to flow through The Dry, is 10km further along and something of an adventure to reach. After fording Jim Jim Creek at the camp site (the sandy creek bed can mean the creek is deeper than the depth indicators suggest), follow a short walk from the car park. From here visitors must swim a few hundred meters through a monsoon forest gorge to the falls (an air mattress is a very pleasant means of covering the distance!). A fairly difficult path up the ravine at the right of the falls leads to a lookout from the edge of the escarpment at the top of the falls. Yellow Water, 50km south of the park headquarters on the Kakadu Highway, is a wetlands near the juncture of Jim Jim Creek and the South Alligator River. The Warradjan Cultural Centre is along the way. The building is circular and its shape reminiscent of the pig nose turtle, hence its name. The displays recount creation myths in which the first people, the Nayuhyunggi, established the land and its laws. At Yellow Water Billabong proper, a raised boardwalk leads to a viewing platform. At sunrise and sunset, the wetland birds and sky views are worth braving the mosquitoes (apply insect repellent beforehand!). Yellow Water Cruises (t +61 8979 1500) take visitors onto the waterways. They are popular and usually require advanced booking, particularly for the dawn cruise. The Gagudju Lodge is in Cooinda, near the Yellow Waters wetland bird spotting area. The junction of the Old Darwin Road and Kakadu Highway is about 11km from Cooinda. The road is passable with conventional vehicles though unsealed and rejoins the Arnhem Highway after 90km through sparse woodlands. The trip from Cooinda to Darwin is about 3 hours' drive via this route. The park's southern exit eventually leads to Pine Creek. Tracks to the south of this road lead to Maguk Walk (12km from the highway and about a 90- minute return walk to a pleasant swimming hole at the base of a small, year-round cascade, and Gunlom Waterfall (36km from the highway and an hour's return walk to a paperbark-shaded pool below a seasonal waterfall). The best way to visit Arnhem Land is as part of a tour group. The Umorrduk (t 08 8948 1306) and Davidson's (08 8979 0413, info@arnhemland-safaris.com) have established a safari camps. Umorrduk's camp is adjacent to the Gummulkbun clan's land. As many as 16 visitors can visit the area, staying in a comfortable bush camp for a day, overnight or longer. The tour is organised around photographing wildlife and visiting rock art sites along the Arnhem escarpment and nearby flood plain. It departs from Darwin. Davidson's is from a handsome lodge at Mt. Borradaile. Their tour features ecological and bird watching events and tours of the local rock art galleries. Seven Spirit Wilderness is in Gurig National Park (t 08 8979 0244) on the Cobourg Peninsula, 200km northeast of Darwin. The park presents a diverse coastal environment-sandy beaches, dunes and grasslands, mangroves and their associated swamps and lagoons, forest. The award-winning tourist hotel provides income for the traditional owners of the area and a well-sited wilderness experience for tourists. Access is by light plane or boat from Darwin.The area is only open during winter. Even more so than elsewhere in Australia, the distances to travel by car in these outback territories are surprising. The Northern Territory border is 1600km north from Adelaide. The road north from the border passes the roadhouse communities of Kulgera and Erldunda and Stuart's Well. The gravel road east from Kulgera follows the Goyder Stock Route, crossing the Ghan on the way to Finke, itself a stop on the former Ghan railway line. Finke is now an Apatula Aboriginal settlement quite near Lambert Centre, the geographical centre of Australia, which is visited as something of a shrine by touring Australians. Erldunda marks the road leading 250km west to Uluru and is said to have the most expensive petrol on the Stuart Highway. 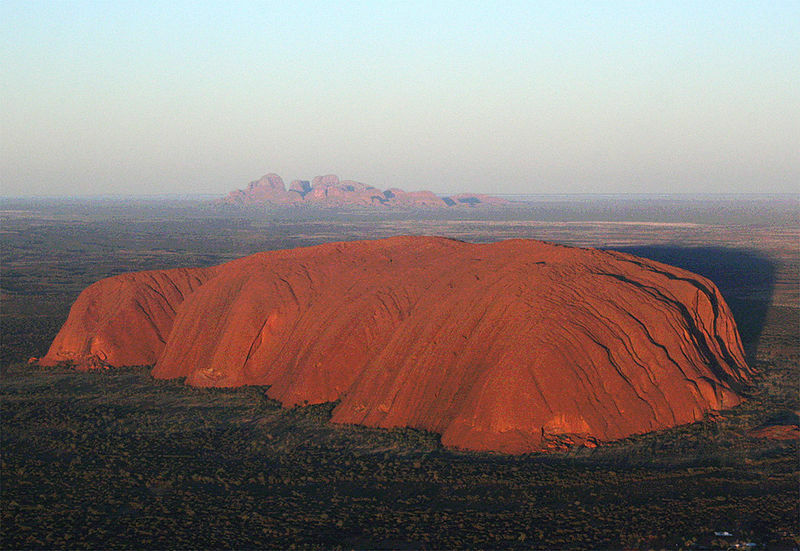 Situated about 450km south and west of Alice Springs, Kata Tjuta (the Olgas), and particularly, Uluru (Ayers Rock) are major emblems of Australia. Their traditional owners are the Pitjantjatjara Anangu. Parks Australia administers them. Geologically, these formations are a sediment of well-weathered Proterozoic material. About 600 million years ago, the southern edge of the surrounding Amadeus Basin began to fracture. A range of mountains was exposed as they were pushed 50km northwards, overriding the basin's edge. Subsequent processes of sedimentation deposited sands which became rock, the material of Uluru, or pebbly conglomerates which became Kata Tjuta. These sedimentary rocks came to the surface as basin movements tilted the sandstone 75 degrees and the conglomerate some 30 degrees. The most recent erosion of these formations left Uluru and Kata Tjuta. A number of caves at the base of Uluru were cut by wave action about 70 million years ago when it stood as an island in an extensive lake. Iron oxide in the fragile sandstone accounts for the subtle red and ochre colours. The first European exploration of the area was undertaken by Ernest Giles in 1872. Although he saw the two formations, he was north of Lake Amadeus and could not cross it. William Gosse and his Afghan camel driver Khamran reached the Uluru in July of 1873 by following Giles's route but skirting the lake on the east. Gosse named it for Henry Ayers, then Premier of South Australia. Giles reached Uluru on his next venture in September of that year. The first scientific collections were made in 1894 when the Horn Expedition visited Central Australia. Baldwin Spencer (see box, p 592), the expedition's zoologist who collected specimens and recorded some of the rock art, subsequently devoted his career to Aboriginal anthropology. The surrounding desert area was set aside as part of the Peterman Aboriginal Reserve in 1920. The first track graded in was from Curtin Springs in 1948. The area around Uluru and Kata Tjuta was proclaimed Ayers Rock-Mount Olga National Park in 1958. Its name was changed, reverting to the traditional Uluru and Kata Tjuta, and it was recognised by UNESCO as a Biosphere Reserve. The monolith itself was built as part of the Wiyai Kutjara story. The two boys made the rock while playing with mud after a rain. At the end of their play, they left Uluru, travelling south to Wiputa in the Musgrave Range, then north to Atila (Mount Connor). Here one of the boys threw his club at a hare wallaby. He missed, but a spring rose where it struck the ground. Refusing to reveal the site of the spring, he nearly caused his brother to die of thirst. The boys fought, eventually ending up on top of Mount Connor where their bodies are preserved as boulders. Tjati (the name in Yankuntjatjara for a small, red lizard living on the mulga flats; in Pitjantjatjara the lizard is called lingka) travelled past Atila to Uluru. He threw his boomerang, a curved kali stick, which embedded itself into the northeast face of Uluru. Tjati dug a series of bowl-shaped hollows at Walaritja trying to retrieve his weapon. The boomerang itself is the curving edge of one of the holes. In some accounts he failed to retrieve his throwing stick and eventually died in a cave at Kantju. His tools and body are the large boulders on the cave floor. In other versions, he found his weapon and stayed here for some time. When he moved to the north side of Uluru, he became known as Linga and lived on honey ants. They eventually chased him to the southern side of the rock where he nearly starved. After eating a Kunia python girl, he left for some place south of the Musgrave Range. Two crested bell-bird brothers called Panpanpalala were hunting an emu at Wangka Arrkal, south of present-day Mulga Park near the South Australian border. They wounded the bird Kalaya with a spear. It ran north to Uluru and the brothers lost its tracks. Meanwhile, the blue-tongue lizardmen Mita and Lungkata had come to Uluru from near Mount Liebig to the north via Mount Currie (Mulya Iti). They burnt the country where they walked, showing how to use fire to manage the land. Reaching Uluru they camped at a cave on the rock's western face overlooking the area around the ranger station. While hunting along the southern part of the rock, they came upon the injured emu which still dragged the spear of Panpanpalala. After they had killed the bird with a stone axe at Kurumpa, to their dishonour they cut it up and started cooking it rather than try to discover who had first speared it. When the crested bell-bird brothers saw the smoke, they came and asked after the wounded emu. Mita and Lungkata lied, saying they had not found the bird. Shortly thereafter the bell-bird brothers found the emu's tracks and realised what had happened. Lungkata and Mita picked up as much of the best meat as they could carry and hurried towards their camp, dropping bits as they ran. The lean joints are now the fractured slabs of sandstone immediately to the west of Mutitjulu. They buried the meaty thigh at Kalaya Tjunta on the southeast side of Uluru just north of Ikari. When the bell-bird brothers caught up with the lizardmen again, they were so angered by the mistreatment that they set fire to the lizardmen's shelter. Mita and Lunkata tried to escape by climbing the rock face at Mita Kampantja, but fell into the fire and were burned to death. The lichen on the rock here is the smoke from the fire and the two half-buried boulders are the remains of the blue-tongued lizards. In other published versions of the story, Mita and Lungkata are a single, particularly lazy, blue-tongued lizard camping at Miltjan. In another, they offered the crested bell-bird brothers the gristly lean joints, lying about the fleshy thighs buried nearby. The Mala hare wallabies travelled south to Uluru from Mawurungu, Warlpiri country near Yuendumu, through the Haasts Bluff area. At Katjitilkil on Uluru's northern side they began preparing for men's ceremonies. The men made a decorated ngaltawata ceremonial pole and carried it up to the top of Uluru. (Because tourists are brash enough to use this same route to scale Uluru, the local people fear for their spiritual and physical safety.) The ceremonies at Kantju and Warayuki on the northeast corner of Uluru began when they planted the ngaltawata there. The women were careful not to know anything about these ceremonies so they collected and prepared food for the men in the caves around the Mala Walk and at Taputji on the eastern side of the rock. One of their wana digging sticks can be seen there in the form of a stone. The old men camped between the women and the ceremonies to protect against accidental intrusion. Their camp is directly opposite Taputji rock. Just as the ceremonies had started, the Wintalka mulga seed men had the bell-bird Panpanpanala invite the Mala to come to a ceremony of their own at Kikingkura near the Docker River. More than wanting the Mala to participate, the Wintalka wanted to use down from the Mala's eagle chick to decorate their participants. Of course the Mala could not interrupt their ceremony and found the request to use their eagle chick feathers offensive. They responded curtly. The call of the bell-bird is still 'Pak', meaning 'They can't come; they can't come'. Their refusal enraged the mulga seed men. In their anger they constructed Kurrpanngu, an evil magic monster in a form something like a hairless dingo dog, a mamu. It moved as a violent wind storm across the sand dunes from the west until it found the Mala track at Muly Iiti (Mount Currie). Then it followed them south to Uluru. The Mala women were dancing at Tjuktjapinya, just to the east of the ceremonial grounds. Their mawulari hair skirts were transformed into the pendant cones of rock at Tjukutjapi. In one recorded version of the story, the women drove him off and he continued around Uluru to Inintitjara to find the Mala men sleeping. For calling a warning to the men, Kurrpanngu turned Lunpa kingfisher woman into a boulder. You can still see Kurrpanngu's paw prints in the rock there. In another version, when Lunpa saw the monster approach she screamed a warning from her home at Ininti waterhole to the women. In a panic, the women fled south through the men's ceremony at Malawati. This ruined the ceremony. The monster caught a Mala man and ate him. Some of the tracks of the Mala run past the northern edge of the Musgrave Ranges to Ulkiya south of the Mann Ranges, others run past Altjinta near Mulga Park Homestead. The Kuniya pythons came to Uluru from three directions. One group travelled west from Paku-paku and Waltanta near Erldunda. Another came south through Wilpiya past Wilbia Well. The third came north from Yunanpa or Mitchell's Knob. A number of Uluru's physical features date from their occupation. The boulders at Tjukiki Gorge, also known as Miltjan, were once Kuniya women sitting in their camp; the tall slab of rock at the head of the gorge is one of their coolamon carrying dishes. A Kuniya python woman from Waltanta carried her eggs either as a necklace or in a manguir grass head pad. Once at Kuniya Piti she dived into the sand, leaving the eggs behind in a ring or she buried them there on the eastern side of Uluru. The Kuniya python woman camped at Taputji where the grooves she made as she left and returned each day can be seen on the north. Kuniya python woman's young nephew had made enemies of some Liru poisonous snake warriors. They came to Uluru having travelled along the southern edge of the Petermann Ranges to the west from beyond Wangkari (Gills Pinnacle). They saw Kuniya python nephew resting just west of where the tourists now climb Uluru and attacked the Kuniya nephew. The scars left by their spears can be seen at Ayurungu on the southwest face of Uluru. He fought as best he could, but was outnumbered and killed. The two black watercourses there are the bodies of two Liru. His aunt, Kuniya python woman, was sad and angry about his death. When she travelled underground from Kuiya Piti to Mutitjulu the Liru warriors mocked her. Beside herself, she began a dance which would give her the power to avenge her nephew and her honour. She had so much power she had to pick up handfuls of sand to hold the poisonous power. Where this sand fell, fig trees and spearvine became poisonous and unusable. In fact her ill-will so infected the place that the local people would avoid the area immediately around Mutitjulu. She had her wana digging stick with her and was going to make a grief scar on the forehead of a Liru warrior. Her anger was so strong that she hit him on the head. You can see the face of the Kuniya woman on the eastern face of the gorge. The wounded, a Liru warrior, is on the western side. His eye and head wounds are the vertical cracks on the face of the gorge. His severed nose is plainly seen. The Kuniya who lives at Uluru rock hole stops the water from flowing into Mutitjulu. She will move away if someone shouts 'Kuka! Kuka! Kuka!' which means 'meat, meat, meat!' in 1977. The Pitjantjatjara and Yankuntjatjara people claimed the reserve in 1979 but the Aboriginal Land Commissioner excluded Uluru from the award. Finally, amendments to the Aboriginal Land Rights (NT) Act and the National Parks and Wildlife Act in 1985 granted these people freehold title to the park. The park has been cooperatively managed with great success by an Aboriginal board and the National Parks and Wildlife service since this grant. Yulara (population c 900) functions as the service village for Uluru and Kata Tjuta. Opened in 1984, Yulara's design takes some care to match the structures with their environment. 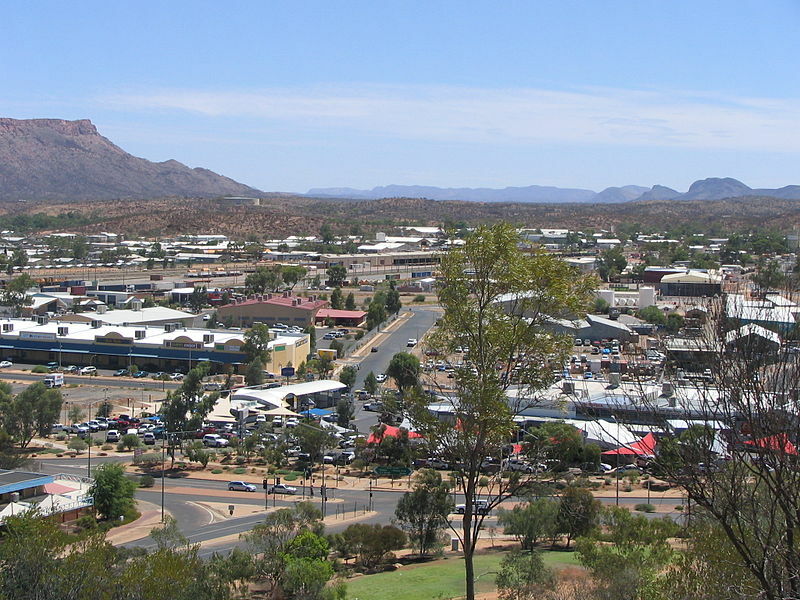 In addition to the only accommodation near the monoliths, the community has a medical centre, police station, service station, modest shopping precinct, and airport providing plane service from Alice Springs, Melbourne and Sydney. Incidentally, Yulara translates as 'place of the howling dingo'. Its Cultural Center (t +61 8 8956 1128) has displays describing the area's geology, natural and social history and presents a collection of photographs of the region. As well as a display describing Uluru and Anangu art, it houses the Maruka Arts and Crafts Centre. This Aboriginal owned enterprise presents dancers and working artists. A number of tour agencies operate out of Yulara. Uluru Aboriginal Tours departs from the Cultural Center and is Aboriginal owned and operated, and gives you an excellent chance to speak informally with the area's traditional owners. Uluru Experience and AAT Kings also have offices here. 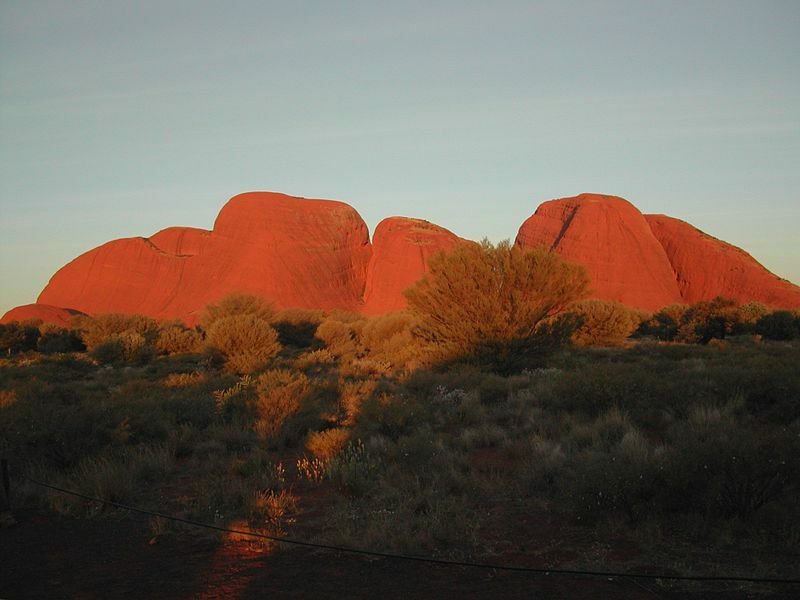 All the tours are alike in that guided visits to Kata Tjuta and Uluru are interspersed with meals and a sunset viewing. The guide on the three-hour walk around Uluru will provide access to and descriptions of cultural sites otherwise closed to inspection as well as relating the mythology of Uluru to its physical features. The walk is easy, but a 20-minute tour from the base of the rock to Mutitjulu is offered as an alternative. Tourists are asked not to climb up Uluru. As well as showing disrespect for Aboriginal beliefs, the climb is difficult and somewhat dangerous in spots and does not present particularly fulfilling views of the desert surrounds. In short, it is a sweaty waste of time which might otherwise be spent learning something about the mythology and way of life of the Aboriginal people who hold Uluru in trust for the rest of us. Greg Lenthen, writing in the Sydney Morning Herald, gives an insightful description of Uluru-climbing: The Aborigines call those who climb Uluru 'ants'. It's not disrespect; just how the climbers look on Uluru's great back. You're told repeatedly that the traditional owners believe Uluru is sacred and should not be climbed. The chain that climbers use traces the traditional route taken by the ancestral Mala men on their arrival at Uluru. Still the tourists climb. But, according to the Ayers Rock Resort, the proportion of visitors who do is declining. (One would hesitate to say falling. Quite a few have. Lightening is also a danger at times.) Parking is at the base of the climb which probably does not further the attempts to dissuade people from making it. The walk around the rock, travelling to the left takes in rock-art sites at Mala Puta and Walaritja and eventually at Mitutjulu. Sacred areas at Ngaltawata and Tjukatjapi on the north, Kuniya Piti on the east and Pulari on the south are protected by fences. The Kata Tjuta is a group of granite and basalt conglomerates initially named the Olgas by explorer Ernest Giles in 1872 after Queen Olga of Spain. It lies about 30km west of Uluru. The sacred significance of the rocks to the Anangu is due to their importance to male education and initiation. Being sacred, the site is closed to visitors. Two trails, however, give glimpses of the 36 domes and the chasms between them. Iron oxide in the fragile sandstone accounts for the subtle red and ochre colours. The Valley of the Winds trail is a three-hour, 6km walk requiring a bit of scrambling as it winds through gorges. The curious round pebbles of granite and gneiss are the remains of a Proterozoic (1.2 billion years ago) mountain range which eventually eroded into the Amadeus Basin. It gives excellent views of the domes. 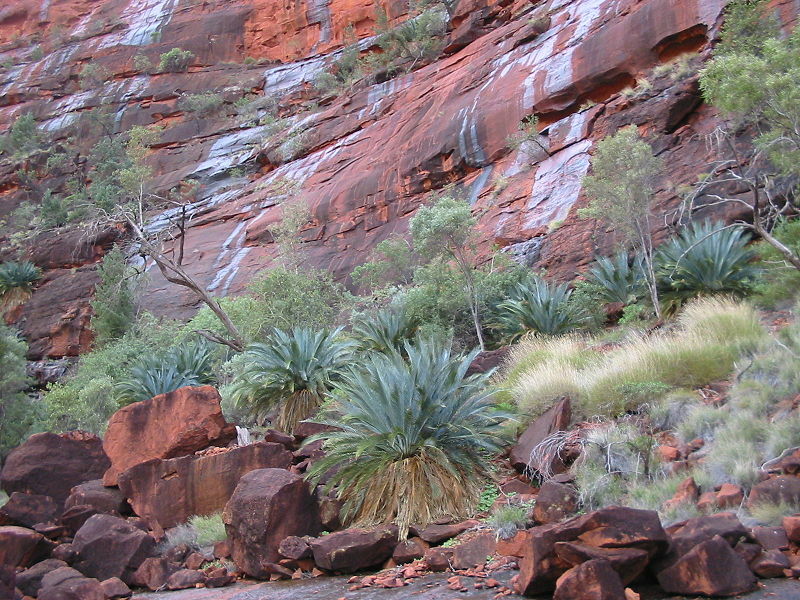 A shorter walk leads into Olga Gorge along the side of Mount Olga. In fact, the picnic area to the west of the rocks just before the junction of these two trails offers about as good a view as that on the Valley of the Winds trail. The best impression of Kata Tjuta is likely to be at sunset from this vantage point. Other trips into this more remote area in the south of the territory are better made as part of a four-wheel drive or camel tour (t 08 8956 0925) booked out of Alice Springs. These normally visit Rainbow Valley and Chambers Pillar. Rainbow Valley is in the easternmost extent of the James Ranges and is known for the subtly attractive sandstone cliffs with characteristic iron oxide colouring. The 50m tall sandstone pillar in Chambers Pillar Historical Reserve was used as a navigational aid for overland travellers prior to the rail line being laid. The Henbury Meteorite Conservation Reserve west of Stuart's Well is about an hour's drive south of Alice Springs on the Stuart Highway. Stuart's Well itself simply marks the junction of Ernest Giles Road and Stuart Highway. The reserve is 16km east and north of the junction on passable unsealed roads. The 12 visually unremarkable craters were made a little more than 4,000 years ago when a meteor broke into fragments quite near the ground. The largest of the craters is 180m across and 15m deep. It would have been made by a meteor about the size of the average 3-year-old child. Astonishingly to the Western observer, the local Aboriginal people, the Luritja, have traditional descriptions of the event. Almost 300km north from the South Australian border, 450km north of Uluru, and 1480km south of Darwin, Alice Springs, known familiarly as 'the Alice' (as in the famous book and film A Town like Alice (1956) by Nevil Shute), sits on an alluvial plain near Heavitree Gap cut by the Ross River in the eastern section of the MacDonnell Range. This range runs east and west and rises steeply from an elevation of about 650m. Gorges and gaps cut these dramatic red mountains, providing year round water holes and pools, literally oases. Some remnant plant life is only found here and in well-watered coastal areas of Australia. Two major rivers flow from the MacDonald Range during winter: the Ross and Finke Rivers eventually run dry both in seasonal and geographical terms. In October, the Henley-on-Todd Regatta offers a series of leg-powered bottomless boat races on the 9dry) Todd River. Alice Springs had lost its quaintness as the isolated centre of the Australian wilderness. It was no longer a one-horse town ... International tourism had brought a peculiar sophistication to the place, still small by city standards but beyond the days of being just a cattleman's town. 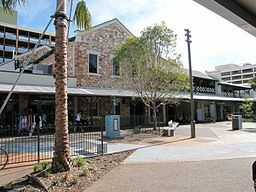 Now the Aborigines sold their boomerangs and nulla-nullas from a glass-fronted craft centre close by the smart shopping arcades. Like other towns along the Stuart Highway, Alice Springs was founded as a telegraph station. J. McDouall Stuart's route of exploration was about 50km west of the site. Surveyor William Whitfield Mills and local pastoralist John Ross brought the telegraph line along Ross River, establishing a repeater station at a spring about 7km north into the plain. They named the station for Charles Todd's wife, Alice. The river in town, usually dry, was named after Todd himself. An associated settlement called Stuart eventually took the station's name, becoming Alice Springs or 'The Alice' in 1933. While some cattle were run in the area early, the population was minimal until the railroad finally reached town in 1929. An extension of this railway to Darwin (a commitment imposed on the federal government when South Australia ceded the Northern Territory) is currently under discussion. The bitumen road to Darwin was completed during the Second World War and its extension south was paved in the 1980s. Service to the area prior to the rail was by camel train. Commemorating the Afghani camel handlers, the rail service is called the Ghan. An unfounded gold rush in the early 1930s brought a flurry of settlement. Most of the population since the Second World War have lived here to service a mid-winter flow of tourists. Sites of historical interest in the area are modest structures and include the Stuart Town Gaol and Hartley Street School in Alice Springs and the Alice Springs Telegraph Station and Hermannsburg Aboriginal Mission in the vicinity. The Hartley Street School also houses the local National Trust Centre (t 08 8952 4516, open Mon-Fri 10.30-14.30, entry $2.00). The town's earliest school building dates from 1929. The gaol dates from 1907-08 and functioned until 1938. As the Trust's brochure states, 'The floor plan and fittings reflect the harsh discriminatory treatment of Aborigines during the time of its use.' It is virtually closed in the heat of summer (Dec-Feb), but normally functions between 10.00 and 12.30 weekdays and a half-hour earlier on weekends. 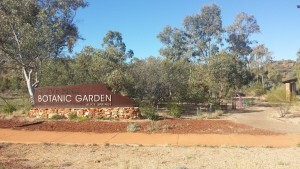 An arid zone botanical garden, the Olive Pink Flora Reserve (t 08 8952 2154; open daily, 8.00-18.00) is across the Todd River from the city's centre. The reserve, named after a prominent early ethnographer of the Aboriginal people in the vicinity, displays shrubs and trees typical in the Alice Springs area. 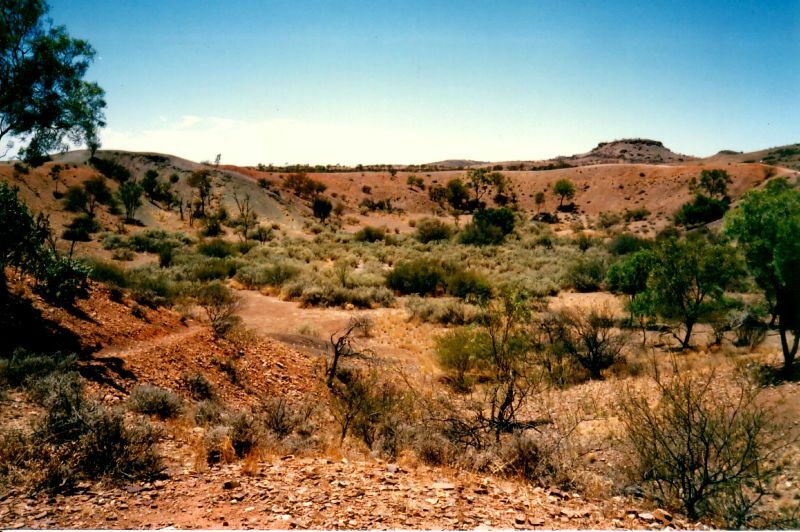 Annie Meyer Hill is an Arrernte sacred site, Tarrarltneme. To the south an east-to-west running ridge can be discerned. One of the first creations of the Caterpillar Spirits, this was where they crossed the Todd River. Maruku Arts and Crafts Centre (t 08 8956 2153) at Uluru, and Alice Springs galleries Papunya Tula Artists, 78 Todd Street (t 08 8952 4731) offer tourists possibly the best selection of Aboriginal and Torres Strait Islander art and craft outside the communities in which they were produced. All of these venues are owned and run by Aborigines, so proceeds go directly to the Aboriginal communities and artists. Also of interest a little outside the centre of town, on Larapinta Drive, is the Araluen Cultural Precinct (61 Larapinta Dr, Araluen, NT 0870, 10.00-16.00 t +61 8 8951 1120). Here is the Albert Namatjira Gallery, with an extensive collection of works by the artist; as well as an important collection of art by contemporary Australian artists and craftspeople. Also in the complex is Alice Springs's performing arts centre, which can seat 500. The gem of the complex are the stained glass windows in the foyer, designed by local artist Wenten Rubuntja, and featuring the popular local theme of the Honey Ant Dreaming. Next door to the Araluen Centre is the Strehlow Research Centre (admission is largely restricted to scholars currently), an excellent and serious centre for the study of Aboriginal culture. Carl Strehlow (1871-1922) was a Lutheran missionary at Killalpaninna and Hermannsburg missions who compiled the first extensive linguistic and ethnographic information on the Arrernte and Luritja peoples. Known as Ingkata, or trusted leader, among the Western Desert peoples, Strehlow was entrusted with the most sacred of artefacts by the Arrernte for safekeeping. These items are stored at the centre, and can now only be viewed by initiated male members of the tribe. Accessible displays, however, discuss the life of the Arrernte, as well as examine the work of Strehlow. The centre's building is particularly attractive, including the largest rammed-earth wall in the Southern hemisphere. Alice's role in modern communication, as one might expect, extends beyond the Overland Telegraph Line. The Reverend John Flynn, founder of the Royal Flying Doctor Service, and Alf Teager experimented with pedal-generated electricity for portable short-wave radio at Flynn's residence, Adelaide House. Their experiments and the impact of the Flying Doctor Service and Teager's radio are described (open Mon-Fri 10.00-16.00, Sat 10.00-12.00, small admission fee, tea and biscuits). The Old Telegraph Station itself is 3km by riverside walk from Wills Terrace or 4km north via the highway. Situated on the billabong-like Alice Springs, the buildings were constructed of local rock in 1871-72. It served as the station until 1932 (open daily 09.00-17.00, admission $13.75, concession 11.50, children 8.50 or 5.00, family 31.00). As mentioned in the geological description of the area, the MacDonnell Ranges extend east to west across 400km. Alice Springs is situated more or less in their centre. 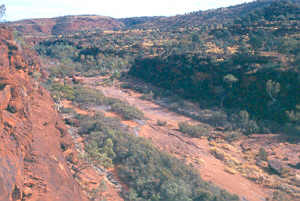 The ranges are steep ridges in which water courses flowing into the Simpson Desert cut ravines and gorges. West MacDonnell National Park (t +61 8 8951 8211) extends west from Alice Springs to Mount Zeil (1531m above sea level, rising 900m above the surrounding plain). Access is via Larapinta then Namatjira Drives by vehicle or via Larapinta Trail from the Telegraph Station. Maps for either are available from the Parks and Wildlife desk in the Hartley Street visitor's centre and at the visitor's centre at Simpson's Gap. At Dr John Flynn's gravesite, just outside the entrance to the national park, Mount Gillen is visible to the south. Flynn was, of course, the founder of the Royal Flying Dctors' Service and the Australian Inland Mission. 22km west of Alice Springs, an unpaved road leads north to Simpson's Gap (open daily 08.00-20.00). The gap was identified by OTL surveyor Gilbert McMinn as an alternative to Stuart's more rugged route 60km further west. The Arrernte people know the gap as Rugutjirpa, home of the Goanna Spirits. 29km west of the Simpson Gap road is Standley Chasm. While glimpses of the wildlife make Simpson's Gap best seen in the early morning or late afternoon, the walls of the chasm are renowned for midday displays of reflected light. Shortly beyond the road to Standley Chasm, the road diverges. Namatjira Drive continues into the western section of the park and Larapinta Drive proceeds as a rough road to Hermannsburg. 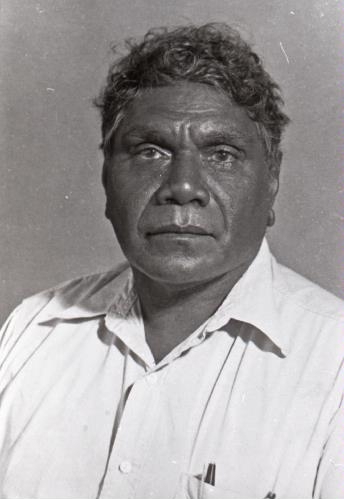 Albert Namatjira (1902-59) was born at the Hermannsburg Mission; he was a member of the Arrernte people, and was a fully initiated member of his tribe. At Hermannsburg in the 1930s, he became acquainted with the artist Rex Batterbee, who encouraged him to paint and trained him in Western landscape style and watercolour techniques. He made his first paintings in 1934 and had his first exhibition in Melbourne in 1938, when all of his paintings sold within three days. By the end of the 1940s, Namatjira was one of the best-known Australian artists in the world. The response to his work epitomises the ambivalent attitudes to Aborigines who supposedly assimilated: while the works were recognised for their stylistic maturity, as Western-style landscapes, they were considered by many purists as being inappropriate for an Aboriginal artist's subject matter. Despite his fame, as an Aboriginal in the Northern Territory Namatjira was denied a pastoral lease in 1949, and his attempt to build a house in Alice Springs in 1951 was rejected. While a special act of Federal Parliament upheld a tax office decision that Namatjira should be taxed for income, he was not considered an Australian citizen. In 1953, the artist was awarded the Queen's Coronation Medal, and the next year Namatjira met the Queen in Sydney. In 1957 he and his wife Rubina became the first Aborigines to be given Australian citizenship, although their children were still state wards. As a citizen, Namatjira was able to purchase alcohol, which he shared with his people. This act led to his imprisonment for illegally supplying alcohol to Aborigines; he was held under house arrest for two months. Three months later he died of a heart attack in Alice Springs. Recent reassessment of his work places his paintings within the history and development of Aranda art and stresses his influence on later artists, including his sons Enos, Ewald, Oscar and Kevin, and his grandchildren. To the east of Alice Springs the MacDonnell Ranges extend about 100km. 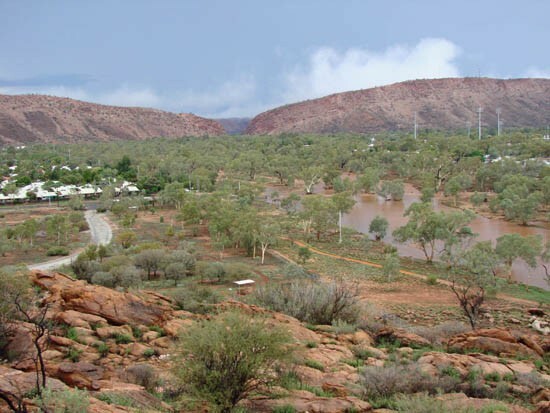 Access to them is via the Ross River Homestead Road from the Stuart Highway immediately south of Alice Springs. This scenic drive passes a number of high ridges and eucalypt-lined creeks. Emily Gap is 10km from the Stuart Highway. Called Anthwerrke by the Arrernte, it was the birthplace of the Mparntwe Caterpillar Dreaming. The site of petroglyphs related to the Caterpillar Dreaming is south of the Ross River Homestead Road at N'Dhala. Four-wheel-drive is necessary to reach the site. Currently a tourist camp offering a variety of bush activities, Ross River Resort (t 08 8956 9711) was originally Love's Creek Station. An interesting day trip to the Hermannsburg Mission is reached west of Alice Springs via Larapinta Drive past John Flynn's grave and Simpson's Gap National Park. The latter is popular as a picturesque river of white sand flanked by red and ghost gums. By the way, the Twin Ghost Gums made famous by artist Albert Namatjira's depiction are just before Standley Chasm (see above). Hermannsburg (t 08 8956 7402, open daily 09.00-16.00) is about 120km from Alice Springs. Like Killapaninna Mission on the Birdsville Track (see p 645), it was founded by German Lutherans trained at Hermannsburg near Hannover in Germany. This seminary had trained missionaries since 1849 following Ludwig and Theodor Harms's methods. Support for the missions were based in the German communities in South Australia. Hermannsburg was established in 1877 after an arduous 22-month trek from the Barossa Valley in South Australia. In keeping with the Harms's missionary methods, the first permanent building was a school. Doctrinal disputes saw its brief abandonment in 1893 prior to Reverend Carl Strehlow's tenure. Strehlow, bush builder Dave Hart and the local Aranda-speaking people rebuilt the mission between 1894 and the turn of the century. Again consistent with German methods, the first school presented the gospel in the local Aranda language. Strehlow and his successor, Pastor F.W. Albrecht, consistently sought to provide educational, humanitarian and aesthetic opportunities well advanced of those advocated in Australia at the time. Carl Strehlow and his son T.G.H. (Ted) Strehlow significantly added to the white population's understanding of Aboriginal culture. Like Johann Reuther and Otto Siebert at Killapaniana, the German missionaries were more likely to record and publish the traditions of their community members. In 1982 the Lutheran Synod returned the land and its buildings to the hereditary owners, the Aranda people. The Ntaria Council renovated the buildings and opened the mission to visitors in 1988; the region is now called by its original name, Ntaria. The 11 buildings are of whitewashed local stone with sheet metal roofing. They seem curiously German amid the palms and river gums. In addition to the school and church, the mission house is open and functions as a tea room, and an exhibit of Arrernte paintings here features work by Albert Namatjira among others. The Finke Gorge National Park (t 08 8956 7401) is 12km beyond Hermannsburg on a four-wheel-drive track. Tours should be booked in Alice Springs and can be joined at Hermannsburg. Travellers who have come as far as Finke Gorge National Park will probably have already noticed the effect that a small amount of dependable water has in the midst of arid country. Nonetheless, a valley full of cabbage palms (20m tall), cycads, eucalypts and shrubs growing in sandstone along the dry bed of the Finke River is a surprise. The area was, in fact, a rainforest as recently as 10,000 years ago. The porosity of the sandstone makes the vegetation possible. The Finke River flows beneath the surface most of the time. Some of its numerous soaks are less saline than the river in such circumstances. They were a necessary water resource for the local western Arrernte. Following heavy rainfall, though, the Finke can spread to several kilometres across, eventually flowing into the Macumba River and Lake Eyre. The cabbage palms, Livistona mariae, after which Palm Glen and Palm Valley are named, are found nowhere else. Their nearest relatives are in two small areas on the Fortescue River in Western Australia and near Matoranka, south of Katherine. The cycads were the world's first seed-bearing plants. The seeds are poisonous, but once ground and thoroughly washed, they formed a staple source of starch for Aborigines throughout the Territory and Queensland. Symptoms of cycad toxaemia are occasionally presented to outback doctors still. The Glen of Palms was first described by Ernest Giles in 1872 in notes he made for Ferdinand von Mueller, director of the Melbourne Botanical Gardens. He had been following the Finke River from Chambers Pillar. Dissuaded from exploring further by fires lit by Aborigines, he did not find either Palm Creek or Palm Valley. These areas were named by missionaries from Hermannsburg. The Horn Scientific Expedition to Central Australia spent time here in 1894. Practically speaking, the area was inaccessible until Len Tuit and Jack Cotterill opened the track and established tourist ventures here in the late 1950s. Of the three trails in the vicinity, the 5km Mpulungkinya Track is the most popular. It proceeds through Palm Valley, then up to a track overlooking the valley and back to the car park. Mpaara Track, also about 5km long, is more strenuous. It proceeds from the Kalarranga car park, following a trail along the Finke River to Palm Bend and eventually to the rugged Amphitheatre. The shortest walk is c 1.5km and offers fine views of Palm Creek and the Amphitheatre. The road west from Alice Springs follows the Tanami Track. It is usually passable with a 2-wheel drive vehicle, although care is necessary in areas of blown sand. Because it traverses Aboriginal land, travellers without a permit are required to stay within 50m of the roadway. WARNING. Ask the police about the road and weather conditions while notifying them of your travel plans. In fact, the road is fairly frequently travelled. The Lonely Planet publication Outback Australia mentions that as many as 40 vehicles per day may pass during the cooler dry season of May through August. The track passes near the Aboriginal community Yuendumu, 290km from Alice Springs, where petrol and provisions can be bought. This is also the site of the Yuendumu Sports and Cultural Festival held over the Northern Territory's picnic weekend in early August. This event is the Territory's oldest festival. An eagerly-anticipated gathering, Aboriginal peoples from everywhere compete in a variety of sports and cultural performances. On the weekend, visitors are welcome and no permits are needed. As many as 5000 people come here for the Games weekend. Yuendumu is also the centre of one of the desert's most public art movements. Just as had happened at nearby Papunya in the 1980s, the principal of the Yuendumu school, Terry Davis, suggested in 1983 that the senior men of the community paint the school doors. Seeing the opportunity to express their heritage values and provide a comment on the European values fostered by the school, the doors were painted in a scale and time frame such as that of ceremonial painting. That the artists here were of one language group, the Warlpiri, facilitated the organisation of individuals' art work. The theme of one of the doors described by Wally Caruana in his book Aboriginal Art (1993) was the creation story in which the Rain Being, having tired of his work making the current owners of the land, transformed himself into a cloud and travelled north. The painting depicted an encounter with a second Rain Being and the resulting deluge and lightning storm. 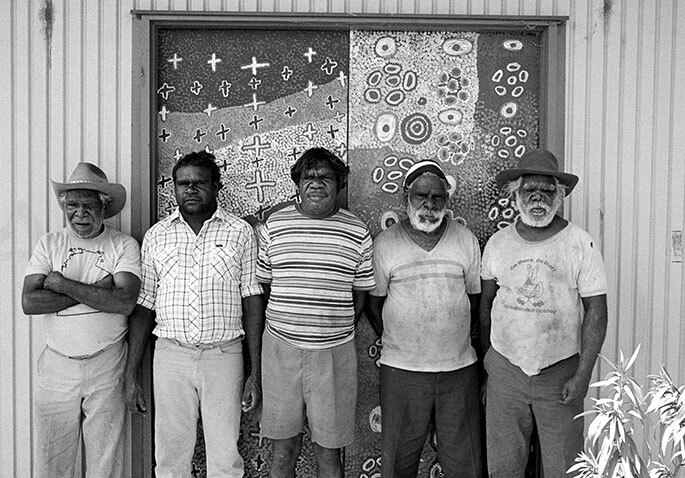 After painting the school doors, these artists began painting on canvases; one of these works, Yanjilypiri Jukurrpa (Star Dreaming) (1985) by Paddy Jupurrurla Nelson, Paddy Japaljarri Sims and Larry Jungarrayi Spencer, is reproduced on the cover of Caruana's book. Subsequently, painting for sale began here on a commercial scale. Women artists in Yuendumu have had a particularly strong role making painting for the public. They had been decorating traditional implements for sale prior to the middle 1980s, largely due to an interest expressed by anthropologists working in the community. The subsequent collaborative efforts are generally more densely worked than the art the men make. Some of the best-known Yuendumu women artists include Libby Napanangka Walker, Uni Nampijinpa Martin and Dolly Nampijinpa Daniels. Cattle stations since the 1920s, Utopia and the neighbouring Mount Skinner were purchased by the Aboriginal Land Fund in 1976. After some temporary arrangements, the Anmatyerre and Alyawarre were granted ownership in 1979. The women in the community began producing woodblock-printed and tie-dyed fabric, but quickly came to prefer batik. Silk became their preferred fabric because it allowed the most fluid brush and pen strokes. With the support of the Central Australian Aboriginal Media Association, they produced a series of batik designs and sold them in 1988 to the Holmes à Court collection in Western Australia. Exhibited at Tandanya in Adelaide in 1989, the success of this project induced the women to begin painting in acrylic as well. 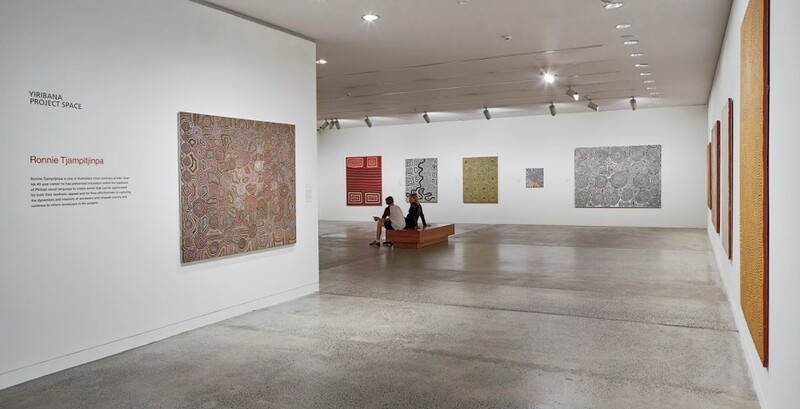 The senior woman of the Utopia Group, Emily Kame Kngwarreye (d. 1998), has subsequently brought international recognition to the region; her unusually powerful paintings, both in 'dot' and 'line' style, have been exhibited around the world, and represented Australia at the 1997 Venice Biennale. Major exhibitions of Emily's work have been mounted by the Art Gallery of New South Wales and the National Gallery of Australia, Canberra. 360km further along the Tanami Track is the Tanami Mine. A four-wheel-drive only branch of the road leads 230km (about 4 hours) north to Lajamanu where Cambrian soils and better water allow eucalypts and some variety of grasses to grow as the road passes through some interesting country to Kalkarindji on the Buchanan Highway. The break between spinifex desert and Mitchell grass cattle range occurs nearer Kalkarindji. About 230km west of Tanami Mine lies the Billiluna community's land near Lake Gregory in Western Australia. The Aboriginal community at Lajamanu are part of the Warlpiri language group; they are closely related to the Yuendumu, having been forcibly settled there in 1947 by the government in order to make way for pastoral and mining interests on their traditional land. Again, the local school provided the impetus for public painting. Their paintings are freer in their compositions than those by the other Warlpiri. Both the Lajamanu and Yuendumu are represented by the Warlukurlangu Artists Association. North of Alice Springs on the Stuart Highway are roadhouses at Aileron and Ti Tree. The Anmatjura people have had the Ti Tree lease since 1971; the Aboriginal communities at Utopia and Pmara Jutunta on the Sandover Highway use Ti Tree as their provisioning station. Along the southern section of the Stuart Highway route, some variety of vegetation and geology occurs until north of Barrow Creek. Much as the desert on the Tanami Track beyond Yuendumu, from Barrow Creek virtually to Newcastle Waters, the flora is hummock grass with occasional acacia bushes. Geologically, the country is from the early Proterozoic remains of the Davenport Range. 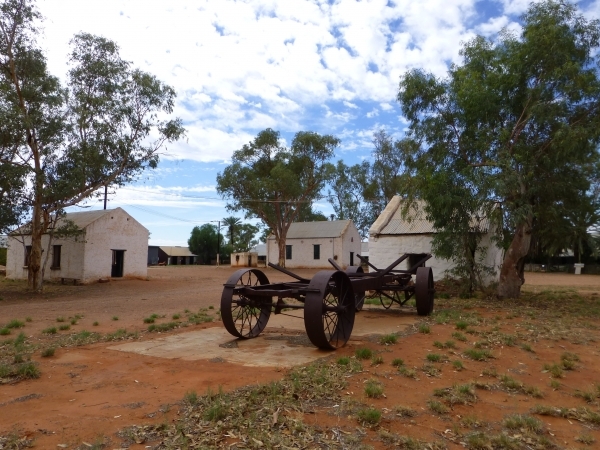 At present a rather drab cluster of buildings with an interesting pub and the remains of a Second World War army camp, Barrow Creek was the site of an attack by Kaytej men on the telegraph station in 1874. The result was the death of station master James Stapleton and a linesman. In the ensuing two months the South Australian government killed 50 or more Aboriginal people. Immediately beyond Wauchope (c 10km north of Barrow Creek) are the Devil's Marbles. These granite boulders were formed by exfoliation. Also known as onion skin weathering, this form of erosion occurs as layers of rock peel away due to expansion and contraction caused by daily warming and cooling of the rock's exterior. These boulders are part of the Davenport Range. While not particularly interesting visually, these mountains have been continuously exposed for 1.8 billion years. 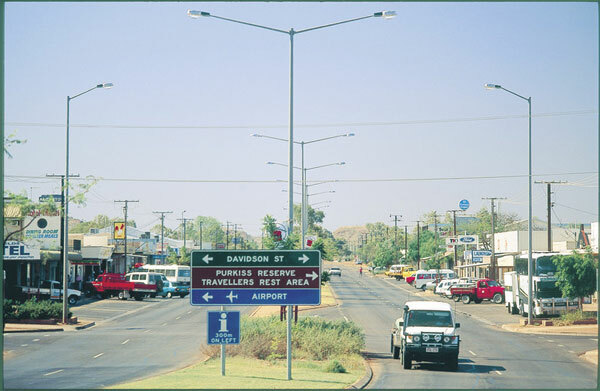 Tennant Creek (population 3550) is the largest town between Alice Springs, 530km to the south, and Darwin, 960km to the north. About 10km south of the Overland Telegraph Line repeater station, it has supported gold mines since the 1930s and a copper mine since the 1950s. Locals sometimes maintain that its site is south of the station because a beer wagon broke down here, it being safer to move the town than to move the beer. Among the more interesting sites in town is the Jurnkurakurr Mural on the side of the Central Land Council Building. It depicts lightning, fire, the budgerigar, crow and cockatoo and the snake, all symbols of particular importance to the neighbouring Aboriginal people. Tourist information centre: on the corner of Paterson and Davidson Streets; t 08 8962 3388. An airport here provides flights with Airnorth (t 1 800 627 474) to Alice Springs, Darwin, and Katherine; and all long-distance bus services will stop at the Tennant Creek Transit Centre, where tourist information is located. The Australian Inland Mission building is a corrugated iron prefabricated structure from the 1930s. These modular structures were designed by Sidney Williams, an architect and designer who had initially specialised in windmills. His so-called Comet Buildings had steel frames and interchangeable finishings and cladding. They are still encountered in remote areas but are generally small huts rather than buildings like this mission. The indigenous population, the Warumungu, call the area Jurnkurakurr. A number of dreaming tracks intersect here and five languages are spoken locally. In a sense, Tennant Creek can stand as an example of the history of Aboriginal/white relations. J. McDouall Stuart reached the area in his first attempt to cross the continent in 1860. The local Aboriginal population resented his intrusion and raided his nearly exhausted party. Stuart named Attack Creek, about 70km north of Tennant Creek, in remembrance of this event. In 1872 the OTL repeater station was established near here. In 1933 an Aboriginal stockman named Frank discovered a gold nugget south of the repeater station. The town site was surveyed and attracted a number of Aboriginal people from central Australia. The Aboriginal Inland Mission established a mission in town in the late 1930s. Among the missionaries were George Cormier and his wife. In 1943 and 1944 the mission opened a ration station and church, but the Northern Territory government decided to move about 200 Aboriginal people 40km north to Phillip Creek. The mission followed. Inadequate water at Phillip Creek necessitated a second move to Warrabi in 1956. In the 1960s the owner of the Banka Banka pastoral station bought six houses in Tennant Creek for retired Aboriginal employees. When legal restriction on Aboriginal freedom of movement was lifted, also in the mid-1960s, the number of Aboriginal people living in and around Tennant Creek increased. Living in camps lacking amenities and marked by social problems, these people formed the Julalikari ('one big family') Aboriginal Cooperative Council in 1985. Working with the Tennant Creek town council, the cooperative began improving life in the camps. In the late 1980s a language centre to foster the locally spoken languages, a health service and a centre devoted to supporting the re-establishment of traditional lands (the outstation movement) have furthered this initial effort. Along the way to Daly Waters, roadhouses serve travellers at Renner Springs and Elliott. Further along, the cattle drive watering stop at Newcastle Waters, now virtually abandoned, was named by Stuart after the Duke of Newcastle, secretary for the colonies. A.J. Browne of Adelaide contracted Alfred Files to bring stock for the area in the 1880s. In 1886 Newcastle Waters became a stop on the Murranji stock route from the eastern Kimberleys to the railhead at Mount Isa in central western Queensland. Scant water along the route prevented its full development until a series of 13 bores were drilled between 1917 and 1924. The Junction Hotel was built in 1932 out of abandoned windmill parts picked up along the stock route. Wet straw cooled the drovers' first few beers; warm beer was their lot once drinking became earnest. The licence was transferred to Elliot in 1962. Road transport had replaced the stock drover. The last overland drive was during the 1988 bicentennial. 1200 donated head of cattle spent four months to make the trip to Longreach, Queensland. At Newcastle Waters small acacia bushes quite suddenly become dominant then give way to eucalypts. Here the soil geology changes from 1.8 billion years old to Cretaceous formations of a mere 100 million years old. These conditions continue to favour scrubby eucalypts (called Mulga in much the same manner as the scrub in the Murray River corridor is called the Mallee) to a point between Mataranka and Katherine where Palaeozoic geology and eucalypts of medium height mark the approach to the Top End. The historical marker commemorating the joining of the northern and southern sections of the Overground Telegraph Line stands on the way to the roadhouse at Dunmarra. 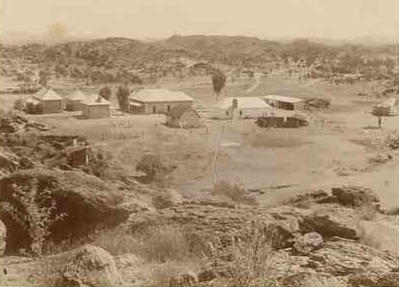 The settlement was named in the 1930s by drover and station owner Noel Healy. It comes from the Aboriginal pronunciation of Dan O'Mara, a linesman who disappeared in the region. Further north, past the junctions with the Buchanan and Carpentaria Highways, is Daly Waters, named after the then governor of South Australia by Stuart on his third and successful attempt to cross the continent. The Daly Waters pub's walls are decorated with just about anything passing travellers have thought to leave. While the building dates from the late 1920s, as a pub it was founded to serve drovers in the 1890s. Incredible as it may seem, this scattering of houses was the site of Australia's first international airport. Qantas used it as a refuelling stop between Australia and Singapore in the early 1930s Sydney to London route. It served a similar function for bombers during the Second World War. Larrimah's population, like most of the roadhouse settlements, is less than 50. In the Second World War, the Royal Australian Air Force (RAAF) built Gorrie Airfield about 10km north of town. At its height the population was 6500 people. The Birdum Hotel was moved from the airfield to Larrimah when the field closed and its facilities were sold. Mataranka is a tourist stop due to its hot springs-16,000 litres per minute at 34ºC. Australians also know it as the setting of Jeannie Gunn's pastoral novel, We of the Never Never (1908). Indeed, it is this region that is generally accepted as the 'true' location of 'The Never Never' of popular description; Henry Lawson wrote The Never-Never Land in 1901, and in 1905, explorer Alexander McDonald, in his accounts of an overland journey, refers to the Central Australian deserts as the Never-Never. 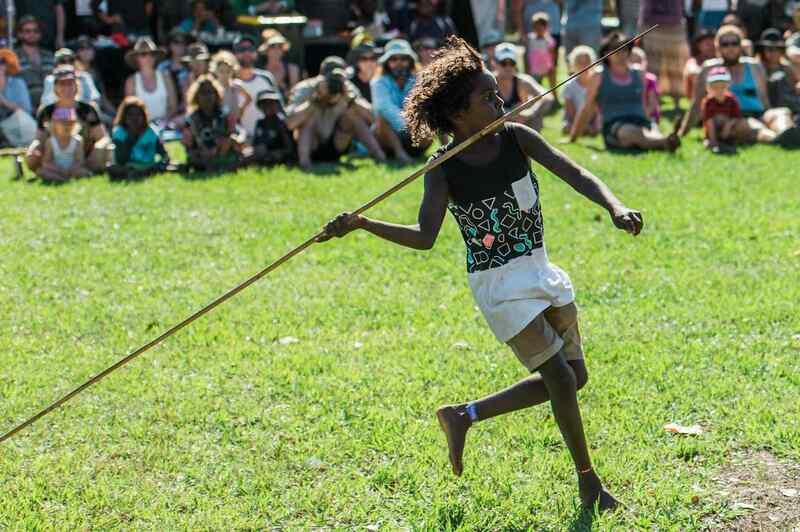 Should you be in the area over the Queen's birthday long weekend in June and have camping gear, try to attend the Barunga Wugularr Sports and Cultural Festival (t +61 8 8941 8066). The four-day event attracts Aboriginal people from across the territory for sports, dancing, arts and crafts. At 1200km north of Alice Springs and a mere 337km from Darwin, Katherine (population 8809) is at the junction of the Victoria and Stuart Highways. Pronounced locally as 'Kath rhyne', it was named by Stuart on 4 July 1862 after Catherine Chambers, a daughter of James Chambers, one of his patrons. The river is the first permanent water north of the South Australian border. In early 1998, the town flooded to such an extent that abandonment was seriously considered. Like Alice Springs, Katherine is a railhead and has some interesting aviation-related history. A Gipsy Moth biplane, originally owned by the area's first flying doctor, Clyde Fenton, is on display at the Katherine Museum (t +61 8 8972 3945, open daily 9.00-16.00) on Gorge Road about 3km from the centre of town. The site of the Overland Telegraph Line station was at nearby Knotts Crossing. One of Australia's best Aboriginal-owned and operated arts and crafts galleries, Mimi Arts and Crafts (t 08 8971 0036), is on Pearce Street which runs parallel to Murphy Street. The first attempts to settle the area were pastoral. Alfred and Mary Giles established Springvale Station in 1878. While not particularly successful, the station began the cattle industry in the region to the immediate north. Currently Springvale Homestead (t 08 8972 1355) is a tourist accommodation on the northern shore of the Katherine River about 3km downstream. A similar station called Manyallaluk (t 1 300 146 743 or +61 8 8971 0877) in Eva Valley is now a prize-winning tourism venture operated by the Jawoyn people. Manyallaluk is a Frog Dreaming site on the eastern edge of the 3000 sq km station which the Jawoyn share with people speaking the Mayali, Ngalkbon and Renbarrnga languages. The station is about 100km north of Katherine and transportation to and from Katherine or Darwin (via Litchfield or Kakadu National Park) can be arranged. The activities include demonstrations of traditional skills (collecting, dyeing and weaving baskets), visits to billabongs and bushwalks. The Katherine Gorge area itself is a series of 13 gorges along the Katherine River in Nitmiluk National Park (t 1 300 146 170), which is about 30km north of Katherine via Giles Street then Gorge Road. The walls of the gorges are not particularly high, but are vertical. Along its more easily accessible stretch the river is about 50m across and the cliffs about the same height. Rapids of varying force separate the gorges. Where the water is too shallow for canoes or air mattresses, trails follow the sides of the river. 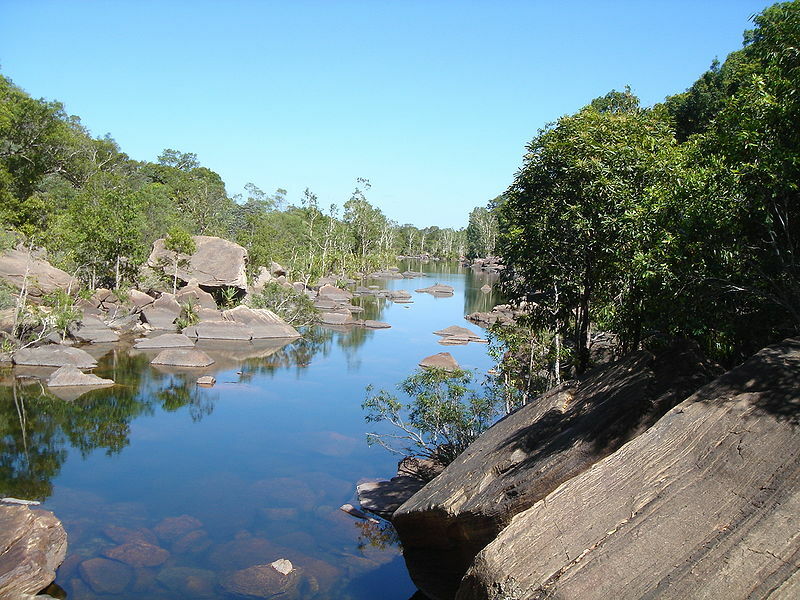 The Katherine River's headwaters are in southern Arnhem Land. The river joins and becomes the Daly River before flowing into the Timor Sea 80km southwest of Darwin. The placid flow from April to October makes it hard to imagine it as a raging torrent during The Wet. In fact, the only cruise scheduled during The Wet is contingent upon the river not being too rough. Signal flora include the salmon gum (so-called due to the colour of its sap), northern ironwood, Darwin woollybutt and an occasional boab tree. In less well-watered areas eucalypt woodlands with acacia and spinifex are the general flora species. Within the gorges one finds mosses, ferns and livingstonia palms, pandanus, silver paperbark and even mangroves. Fauna includes a variety of wallabies, freshwater crocodiles and long-necked tortoises. 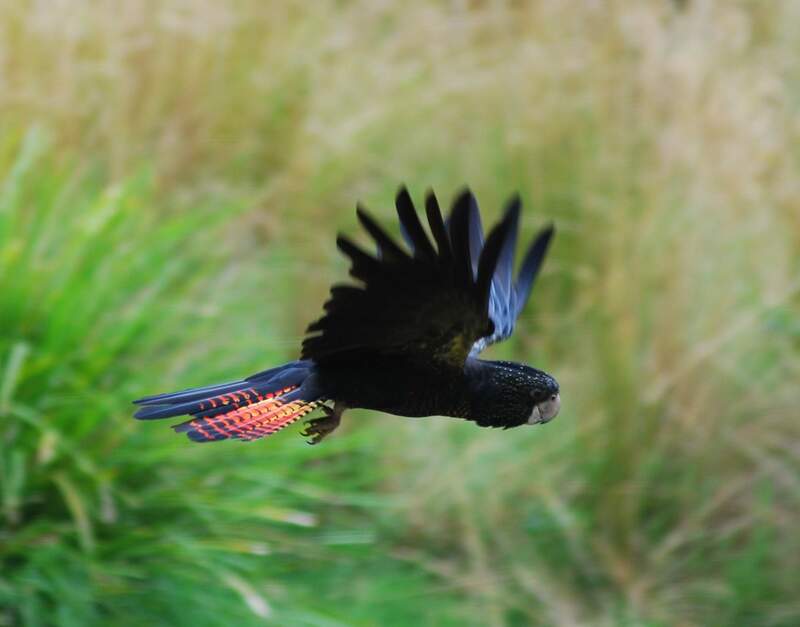 The birds, particularly around the picnic areas, include friar birds, red winged parrots, black cockatoos, grey bower birds, blue winged kingfishers, and honeyeaters. Butterfly Gorge walk is about four hours long or 5.5km return. It passes through a pocket of monsoon rainforest on the way to the second gorge. The crow butterflies often seen in the ravine descending to the river provide the name. Properly provisioned, a walk to Butterfly Gorge followed by an air mattress descent by river to return to the visitor's centre is about perfect. The walk itself follows black and white markers to match the colours of the butterflies. The first track encountered to the left (north, blue markers) is the Lookout walk; the next track to the left is to Windolf lookout following yellow markers. The Butterfly Gorge track is the third track to the left and about 3.5km from the information office. The track to the right at this juncture leads to Lily Ponds. This 7km walk to the third gorge will take six hours there and back. Should camping overnight be desired, a site at Dunlop Swamp on the way to Smitts Rock is reputedly a pleasant stay. The visitor's centre will have information regarding the availability of camp sites.